This harness is simply the best balance/mobility/support harness available! 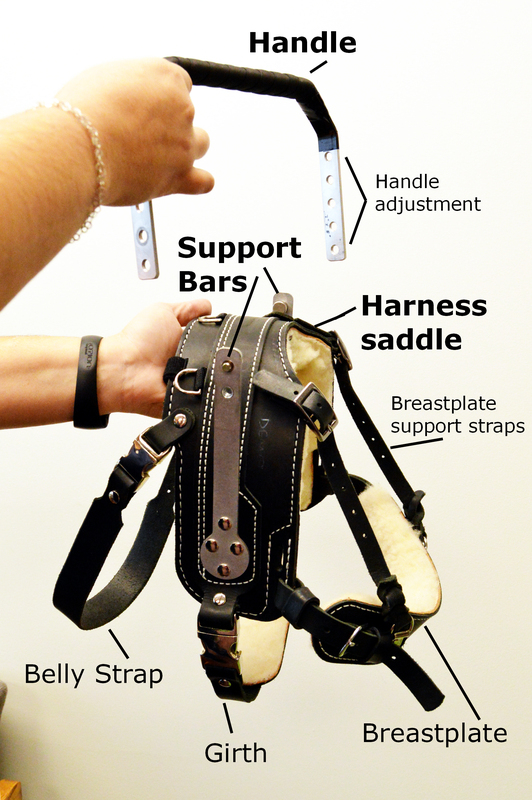 See and print our Booklet of Complete Harness Info with updated options! Turnaround Time: Harnesses take 4 weeks to complete and are built to your specifications. There’s a lot of information! Detailed descriptions, sizing, options, etc. can be found below. First, select harness size below, then fill in the Measurement Details, select your options, and finally, add to cart. Final price depends on options selected. Choose from these options to customize the harness to meet your needs. Must be selected when order is placed, as these are built into the harness. 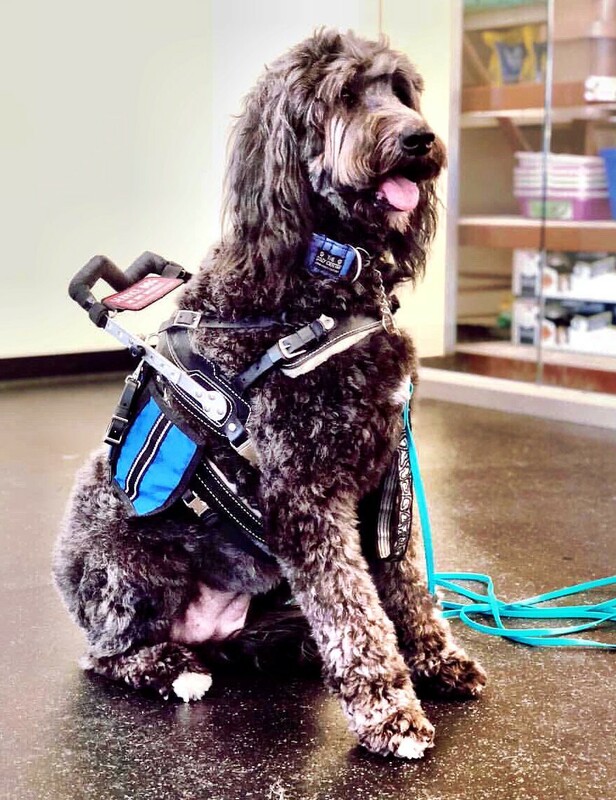 BLD’s specialty service dog harness is designed to provide balance and stability support for people with balance or mobility impairments, as well as for anyone needing good communication and contact with their service dog. 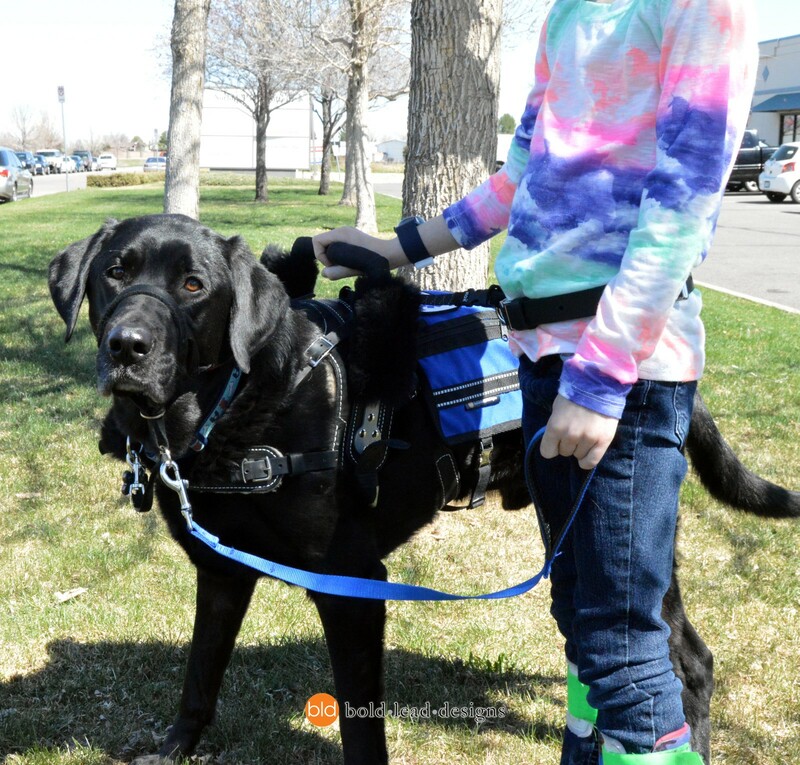 We have designed this harness with the dog’s physical structure and movement in mind, and then added features to make it user-friendly and truly accessible. 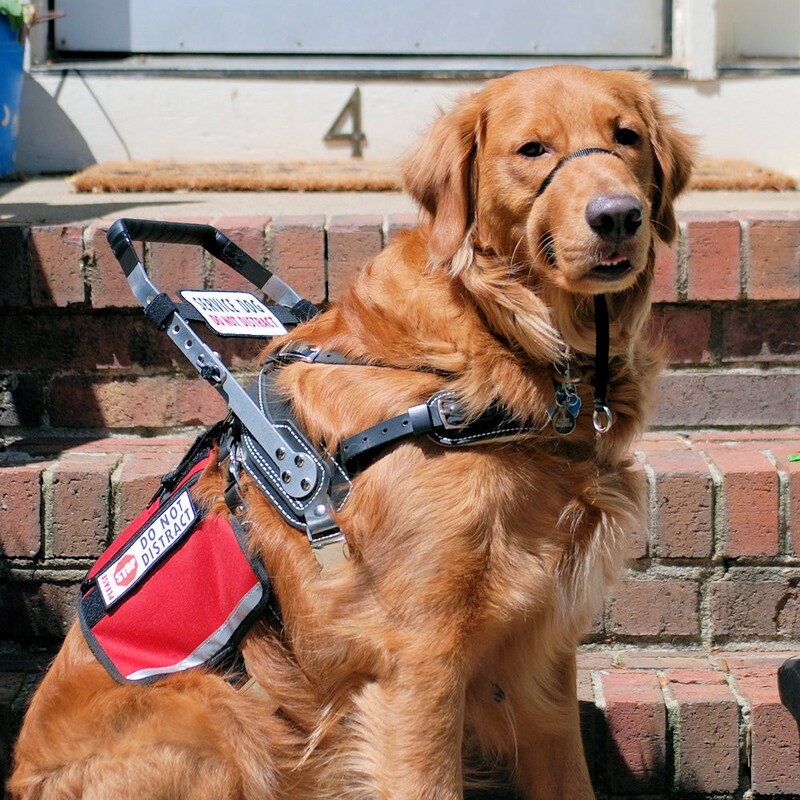 This is the most stable, ergonomic and functional service dog harness available! 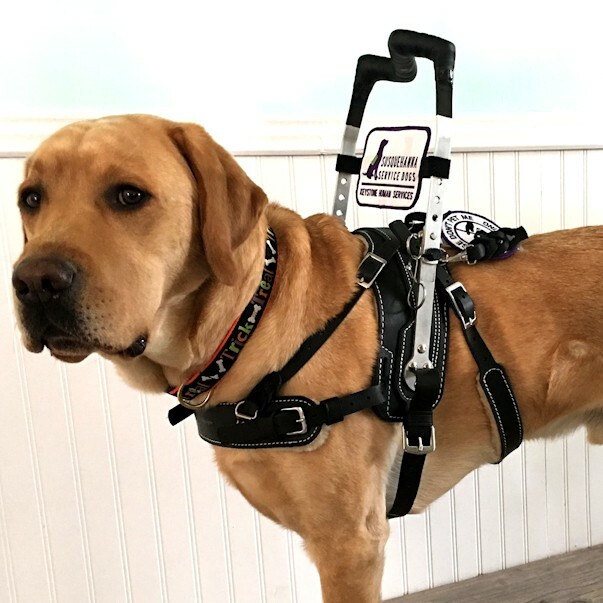 Guided by a veterinary orthopedic surgeon, canine sports medicine experts, and canine physical therapists, BLD’s unique harness design allows the dog to move, breathe, and work with minimal impact from the equipment. 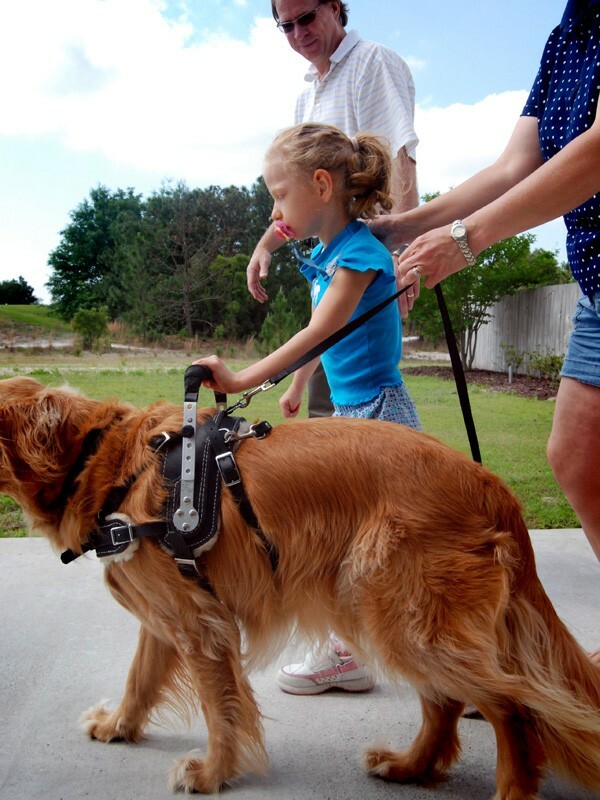 Weight and pressure are properly distributed across the dog’s body for optimal performance of physical assistance tasks. 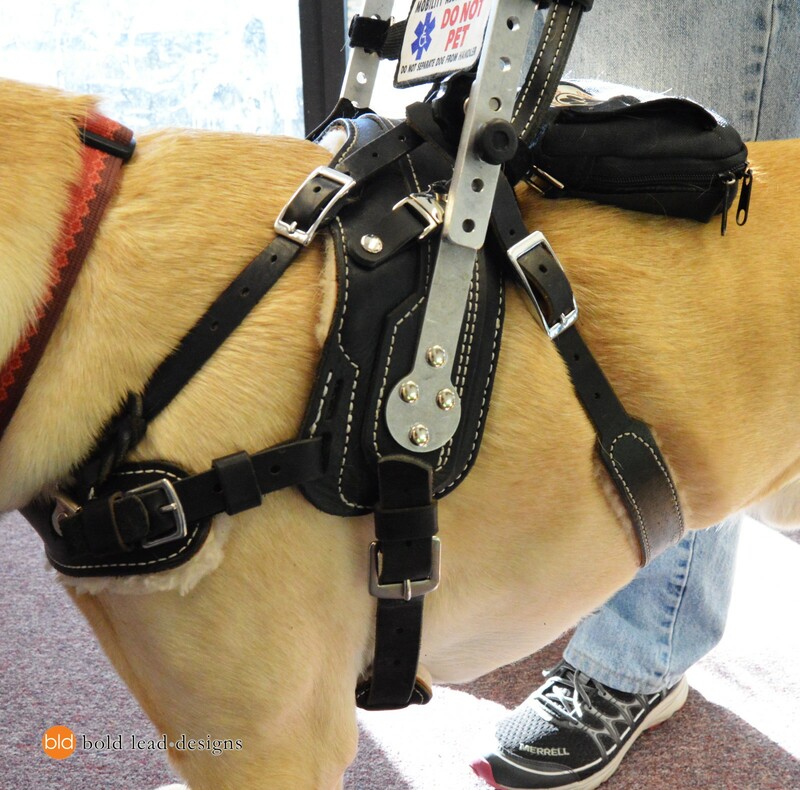 Similar to a horse saddle, this harness sits just behind the withers (or shoulders), around the dog’s center of gravity. 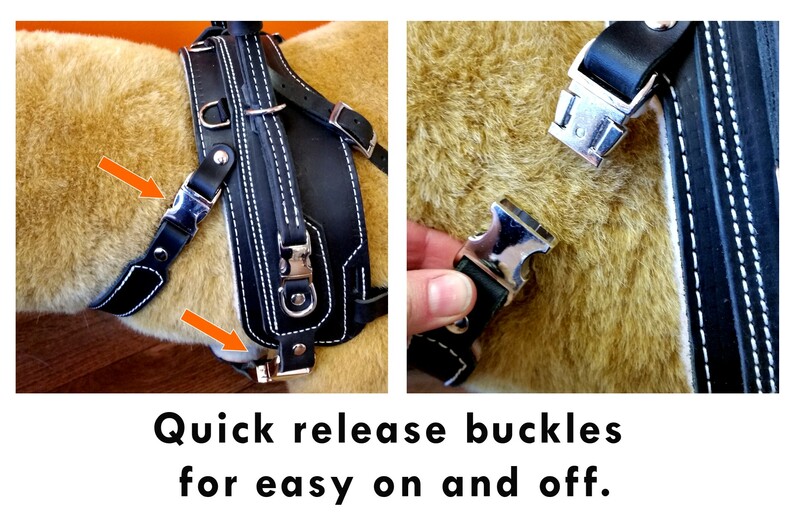 When fitted properly, this harness does not wobble, shift, pinch or rub the dog. It is lightweight, sturdy, and very comfortable. BLD’s innovative harness design has benefited thousands of people around the world since 2009. 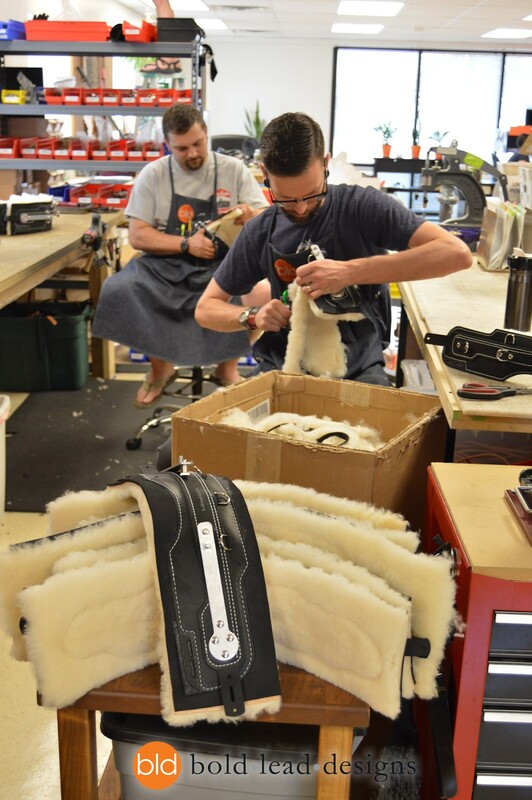 Every harness is custom made by hand in our own Colorado workshop. A variety of handle options are available. 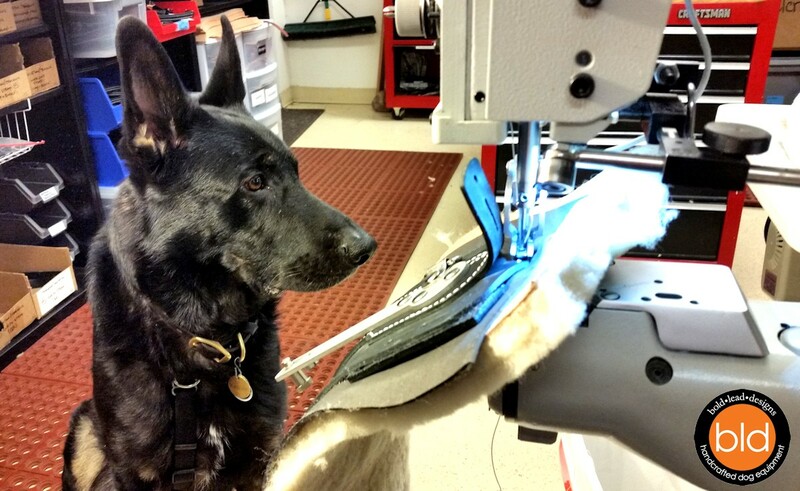 Crafting each harness to order is how we are able to provide the right fit for the dog, while meeting the user’s individual needs. Proper fit is assured by our Great Fit Guarantee. Our famous Lifetime Warranty, plus BLD’s excellent customer support, is standard with everything we make in our workshop. See details on p.18 or on our website. 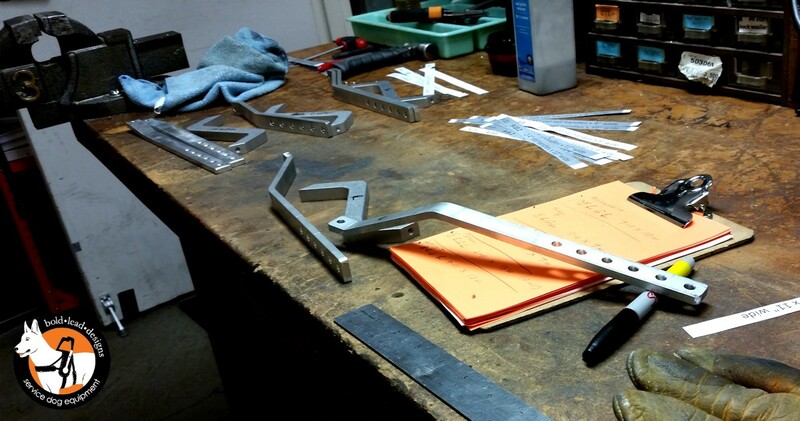 You may order online, call, email, or make an appointment to visit our workshop to order. Our friendly team is here to help with any questions you have before, during, and after placing your order. Our harness experts will review all the details to help you get the equipment you need and to ensure the best fit possible. And yes, we ship worldwide. Please allow 4 weeks for completion. Sorry, rush options are not available at this time. The MSH can be a good option for people with balance impairment, disequilibrium, neurological conditions, MS, Parkinson’s, or other conditions where light to moderate contact, with a rigid vertical handle, can assist with orientation and/or balance support. 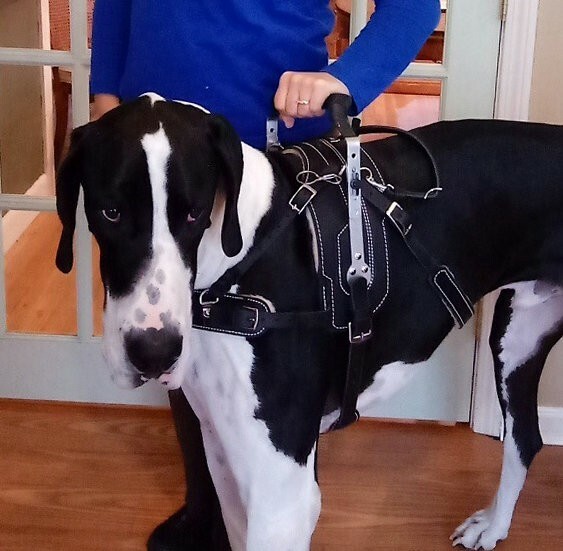 This harness can provide light bracing while the dog is standing. An additional handle can be added to allow the MSH to assist with momentum, gait stabilization, leading, and counterbalance support while in motion. NOTE: Rigid support handles are not meant to be leaned on for constant support, to pull on, or use for momentum while walking. 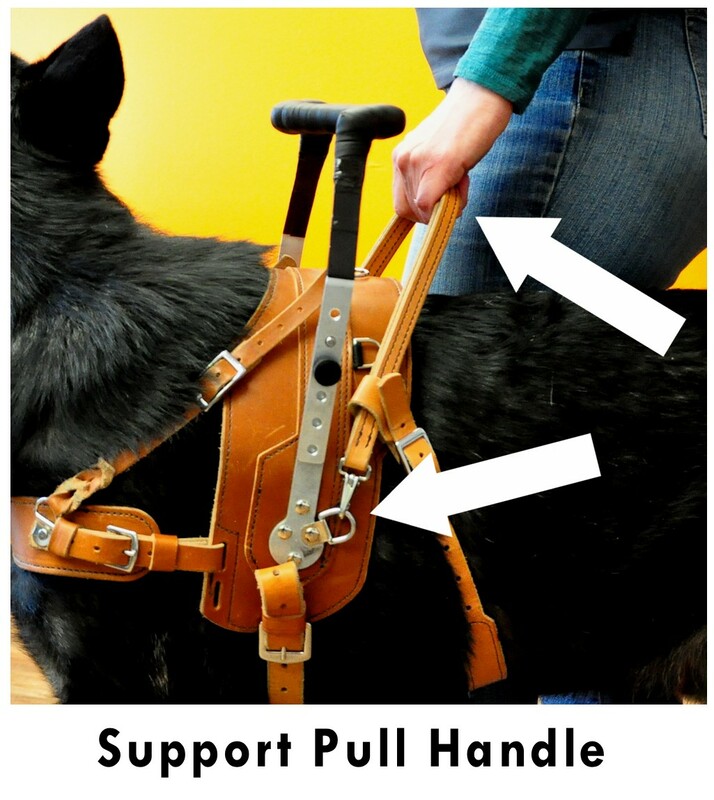 Heavy pressure should not be applied to the metal handle, especially while the dog is in motion; not recommended for those with ataxia. Lightweight despite its sturdy nature! D-rings for attaching accessories, such as a cape, pouch, ID badges, pulling strap, etc. For most dogs 60-95 pounds, with a girth size of 26-34 inches (best choice for most retrievers and doodles). NOT available for dogs under 60 pounds. 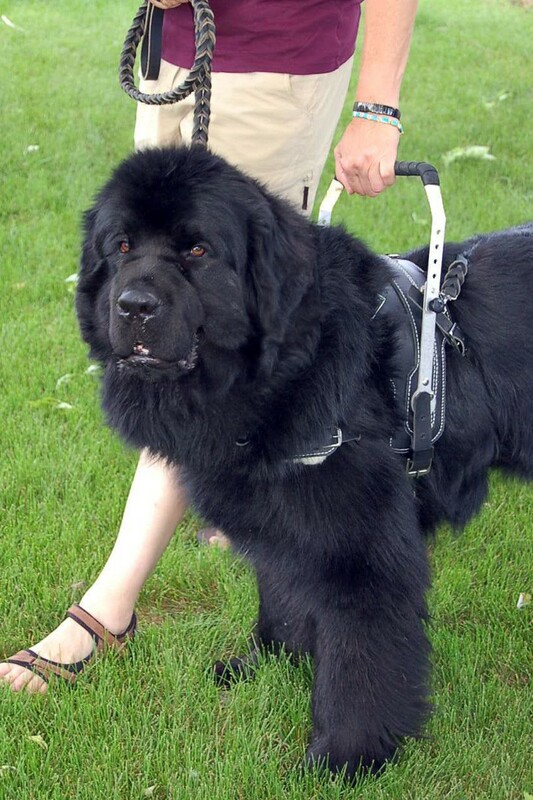 For dogs 140-200 pounds, with a girth size over 40 inches (best choice for larger Great Danes, Mastiffs, etc). Tall handle over 8” is not available. London Tan (add $20): Gorgeous vegetable tanned Bridle leather! Color and shades will vary; each part of harness may be a different shade. Tan leather naturally appears rustic and may show scuffs and wear over time; color may darken with use over time. All straps are made to fit your dog’s actual measurements. Please be sure your dog is of appropriate age, size and soundness for the work you are asking him to perform*. Need help with sizing? Don’t worry. Just ask. We‘ll take a look at your dog’s measurements/breed/weight to be sure you get a perfect fit. 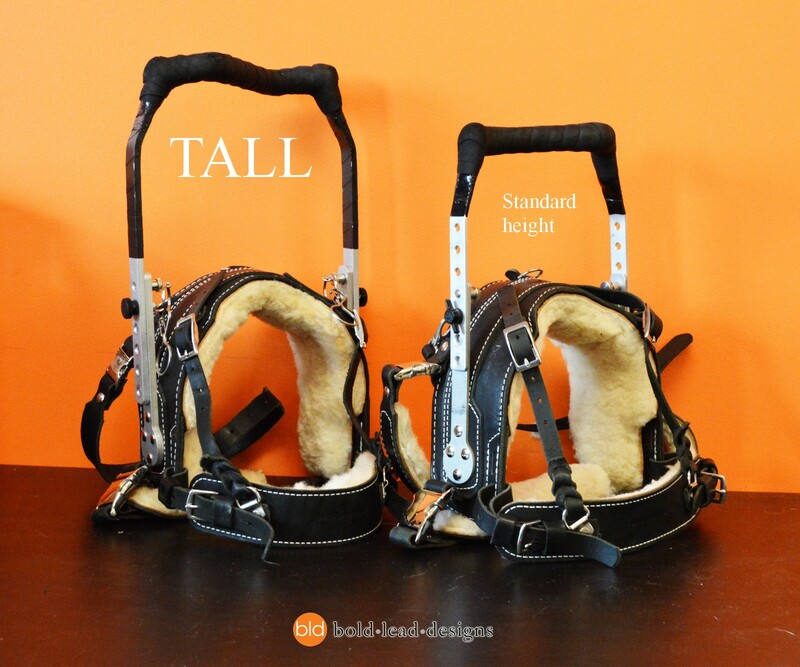 Height is the distance between the top of the harness saddle and the top of the handlebar. 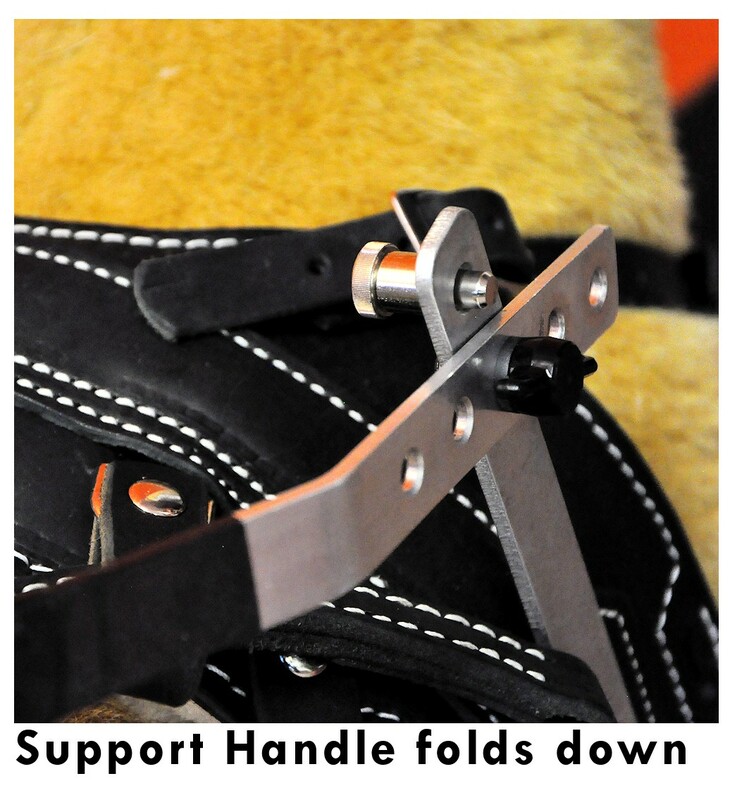 Support Handle adjustment range is approximate; exact dimensions depend on the harness size and dog’s width. TALL option includes heavier gauge metal and upgraded support bars on saddle. *Applies more torque and pressure to dog than shorter handles. Not recommended for most users or for any dog smaller than our recommended size. Consider the BAH if tall handle is required. Note: Handles 6″ or lower will be the most stable, lowest impact, and are ideal for mobility work. Choose from these options to customize the harness to meet your needs. Must be selected when order is placed, as these options are built into the harness. Standard handle grip is ambidextrous. Your hand and elbow will be poisoned directly over the dog’s body, with your palm facing back. Ergonomic Grip (add $50) Highly recommended! Z-shaped handle grip allows for more natural hand and arm position. Allows your arm and elbow to relax in toward your body, while your hand remains centered over the dog. 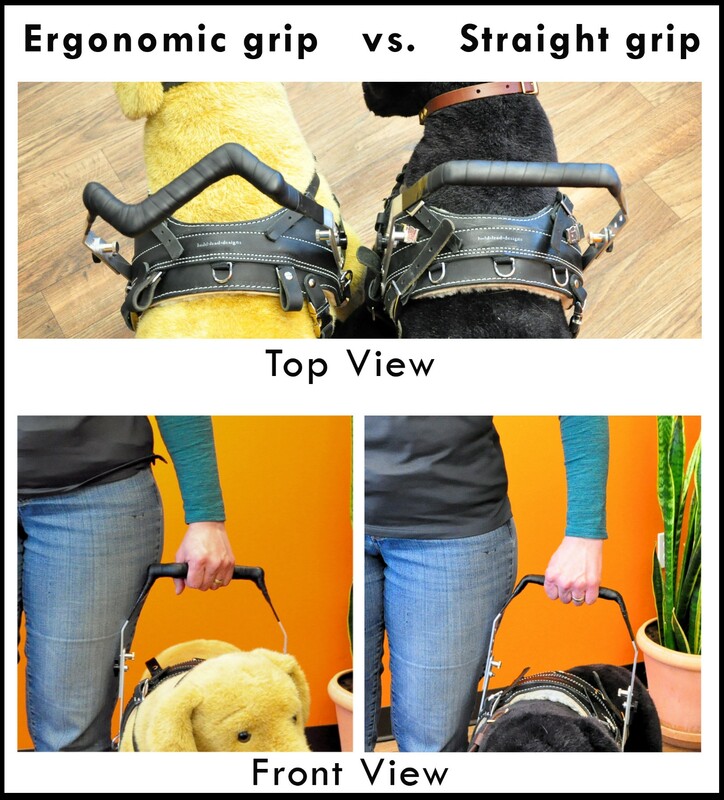 Ergo grip is comfortable and balanced for most people, especially those with hand/wrist/shoulder mobility issues. ALL support handles fold down! Handle folding mechanism is engaged by pulling two small pegs—one on each side of the handlebar. 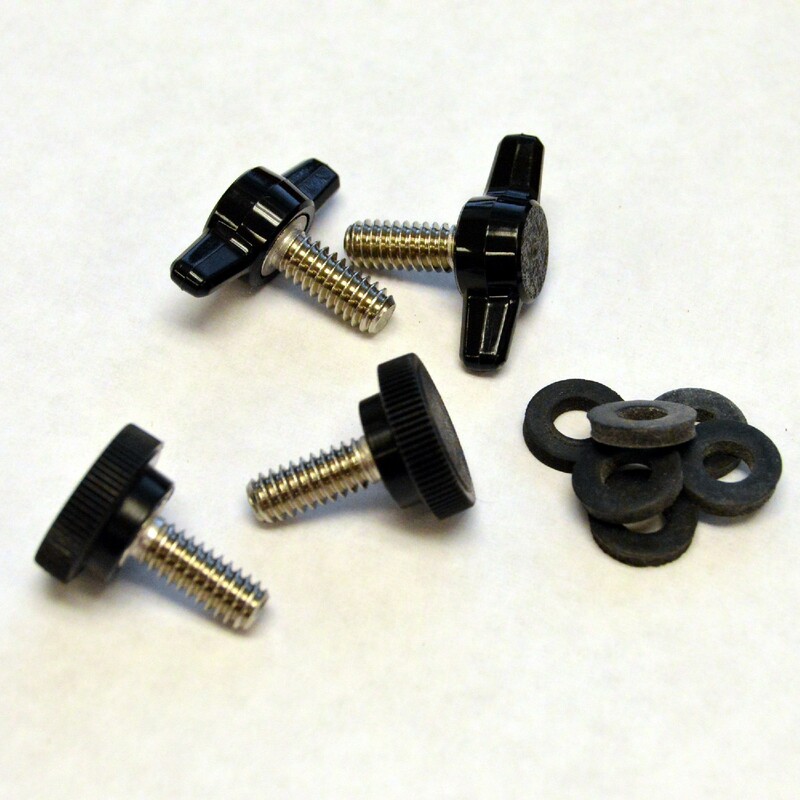 Standard release pegs are a small metal knob (dime sized). Can be operated together or independently when locking mechanism is engaged. Pull-Rings* (add $25) Highly recommended for weak hands or one-hand operation. For people with limited dexterity who have trouble grasping a small peg, pull-rings can be added to make it easier to operate the handle folding mechanism. Includes nifty InfiniKey extenders for convenience. *Must be ordered with harness if needed, cannot be added later. 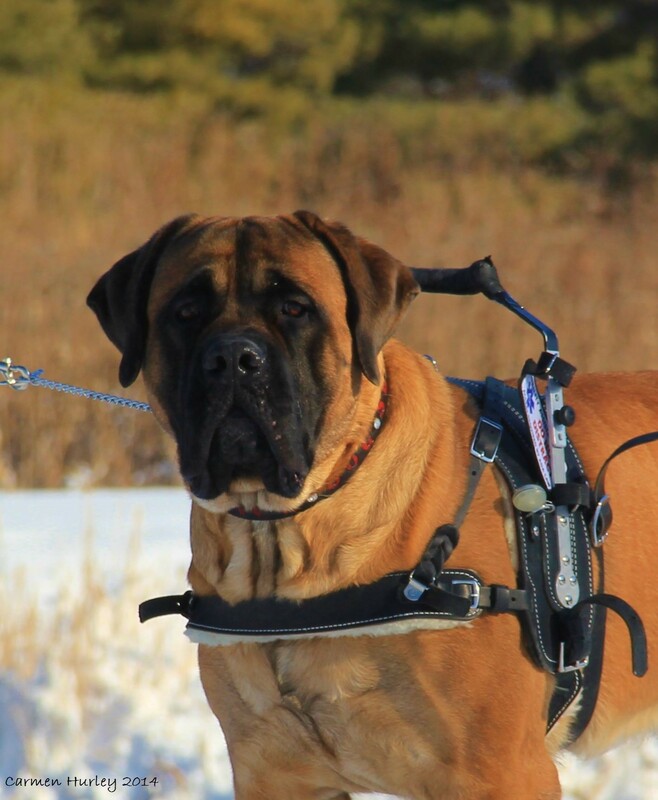 Customize your MSH harness for pulling, leading, forward momentum, and guiding; several handle styles to choose from. 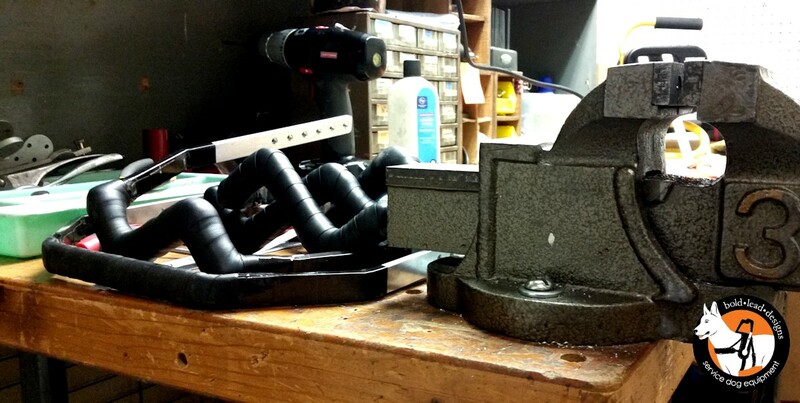 Remember, the metal support handle is for vertical pressure and very light bracing only! These additional handle options can be made to ANY height/length: longer, or shorter than the metal Support Handle. We recommend having it made 1 inch shorter than your metal Support Handle, unless you specify otherwise to meet your needs. Support Pull Handle: Highly recommended! Allows for heavier pulling, momentum, and counterbalancing needs. 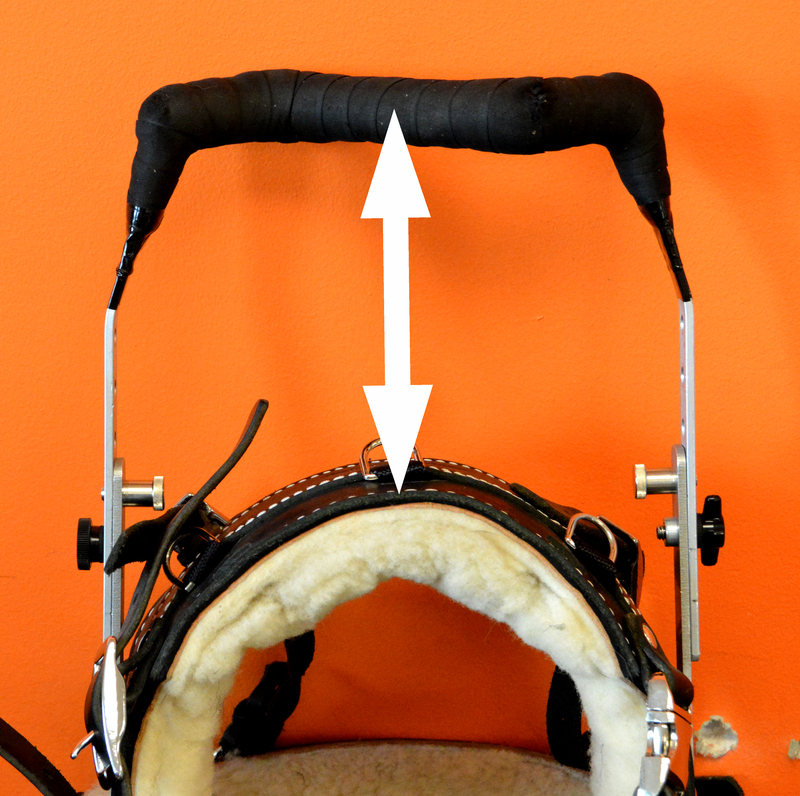 Mounts lower on the harness for optimal pulling pressure distribution. Support D-Rings are added to the base of the handle support bar, handle attaches with spring snap clips. “Mouse ear” loops keep the handle in position at a slight angle back. This handle drops a bit when you let go of it, has a looser feel, but is best for those who need moderate gait stabilization or a sturdy momentum pull. Available as a flexible handle, or semi-rigid which is reinforced for a sturdier feel. 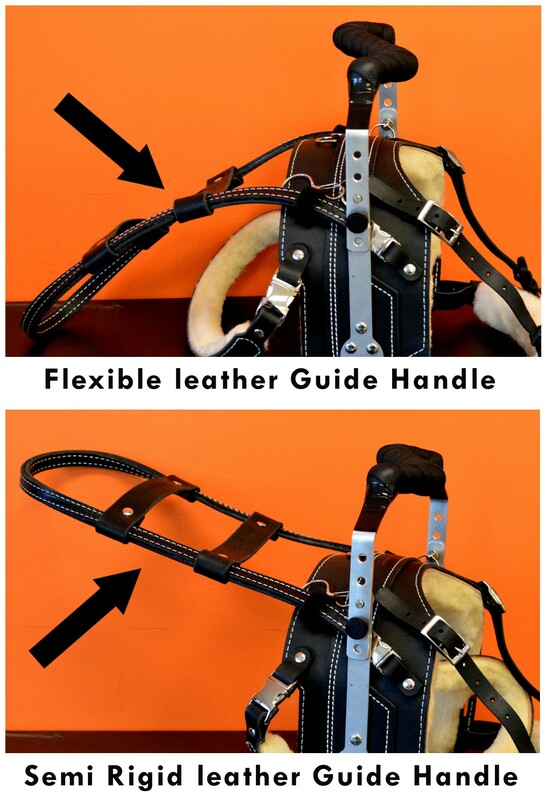 Leather Guide Handle: Allows for are for light-duty leading or momentum. This sturdy handle offers excellent communication and directional feedback. Attaches to the front edge of the harness, and angles back behind metal support handle for proper leading or momentum contact. 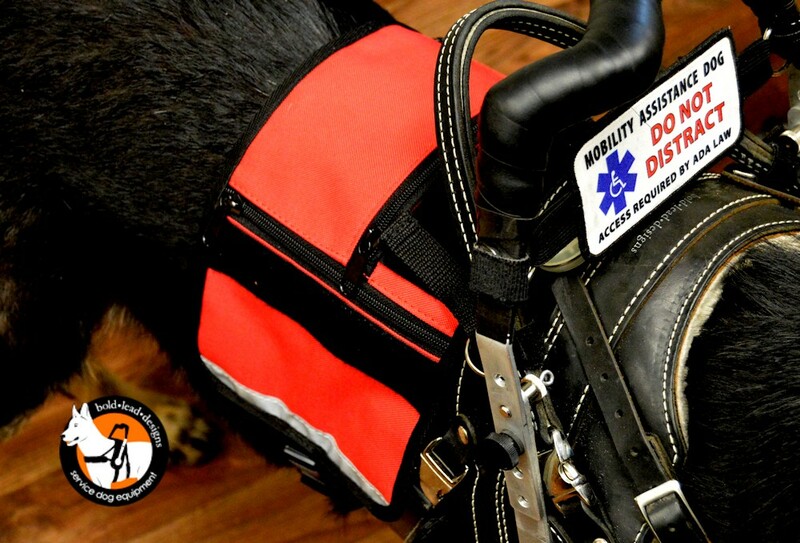 Includes quick-release buckles mounted to the front portion of the harness saddle, and Velcro stabilizers (not easily removable). Available as a flexible handle, or semi-rigid which is reinforced for a sturdier feel. A brace strap may be added to support pull or guide handles to stabilize the handle loop, depending on the height/length of your handle. Standard metal Quick-Release latches are standard on the girth and belly straps, they are very easy to use and effective. NEW! 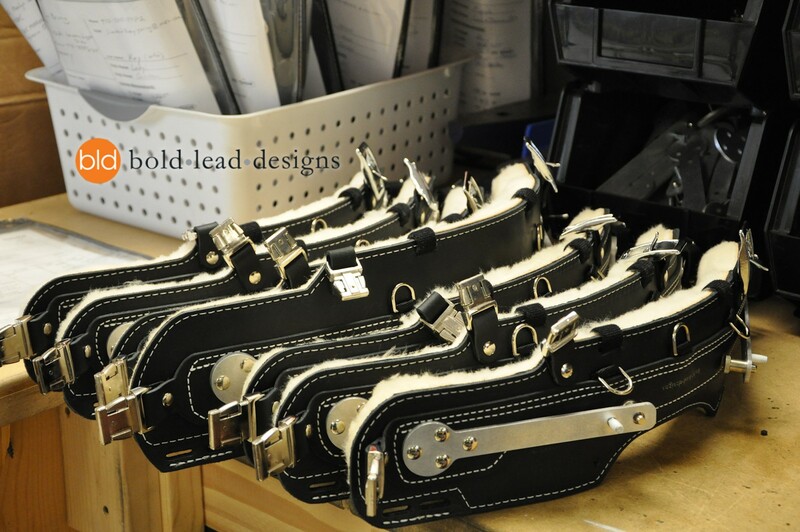 Magnetic Latches (add $36) Magnetic Latches on the girth and belly straps. These special latches are very easy to use and are secure. Ideal for those with very limited strength or dexterity and for one-hand operation. Magnets automatically align and close the latch. Pull-tab releases the latch. 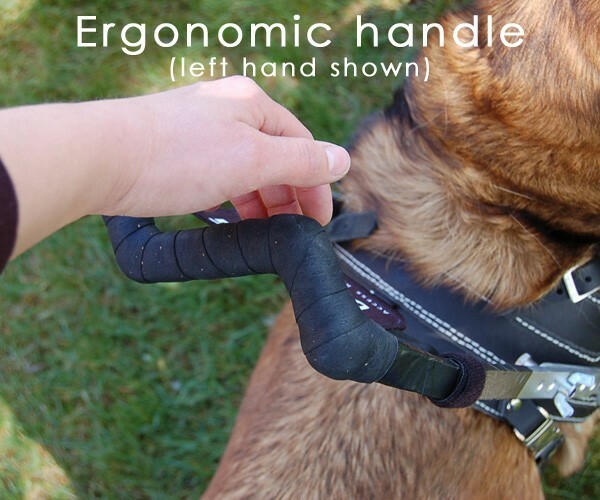 Includes D-rings for easy grasp when fastening the straps on your dog. Extra set of bolts: $6 *Highly recommended! Removable bolts hold the handle onto the harness. Keep a spare bolt handy at all times, just in case. 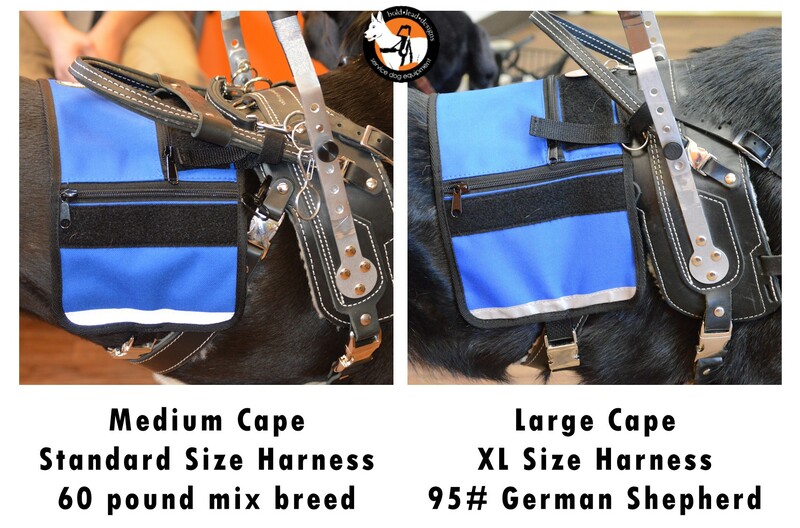 Cape/Vest: specifically designed to be compatible with your harness! 3 pockets, and 3 Velcro panels to add patches (available separately). 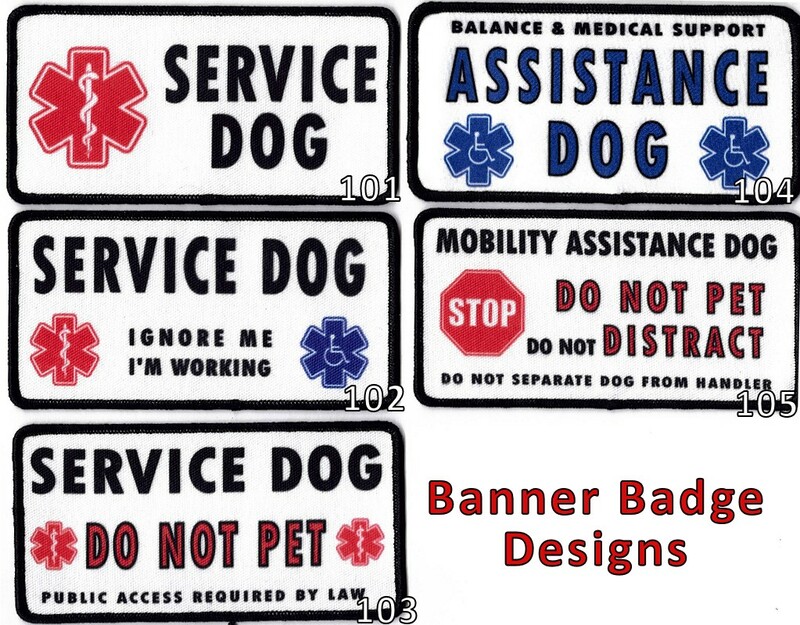 ID Patches & Badges (available separately): Many designs to choose from. This harness has been designed with interchangeable straps for the greatest flexibility; perfect for adapting a harness to fit a new dog or user. You may order replacement parts any time you need them. Support handles are replaceable if the harness is built to accommodate the height you need. Harnesses take 4 weeks to complete and are built to your specifications. 3 week RUSH: add 10%; 2 week RUSH:add 15% Sorry, rush option is currently unavailable. 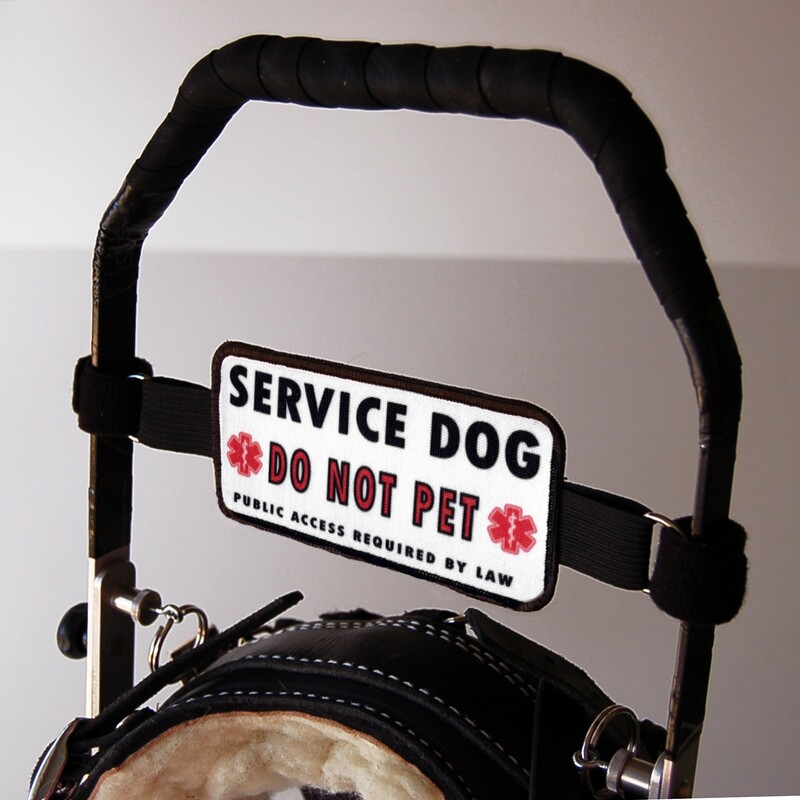 Due to the custom nature of this special harness, returns and refunds are not available on this product. Rigid and tall handles apply more pressure and torque to the dog than flexible or shorter handles, due to the laws of physics. 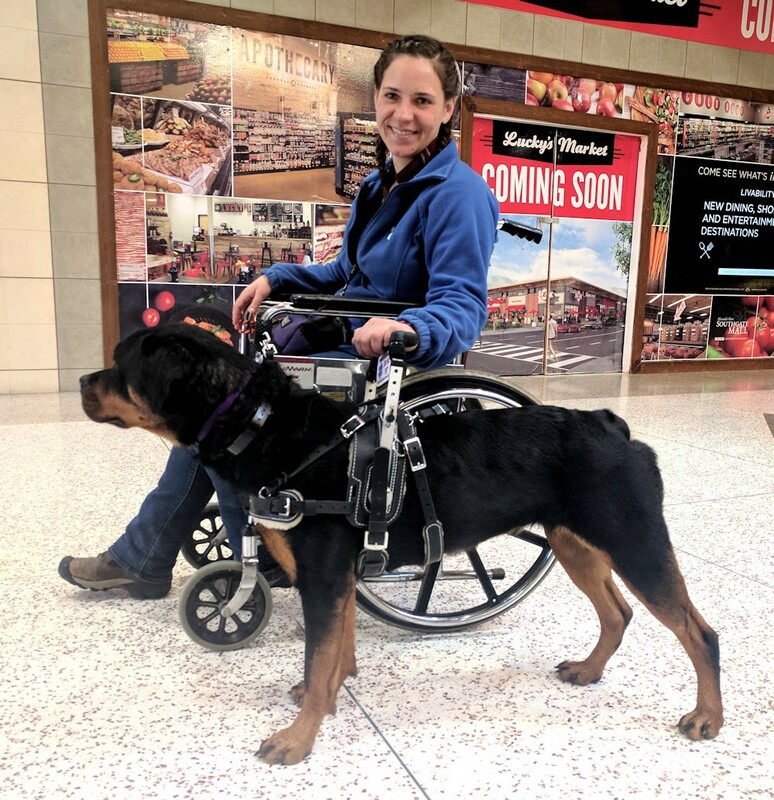 A dog should never be expected to replace the heavy-weight-bearing capacity of a cane or crutch, or move under heavy torque/pressure/weight on the handle. Dogs should be at least 18-24 months of age before training in a harness. Dogs must be physically mature and of appropriate size, fitness and soundness for the work you would like them to perform. 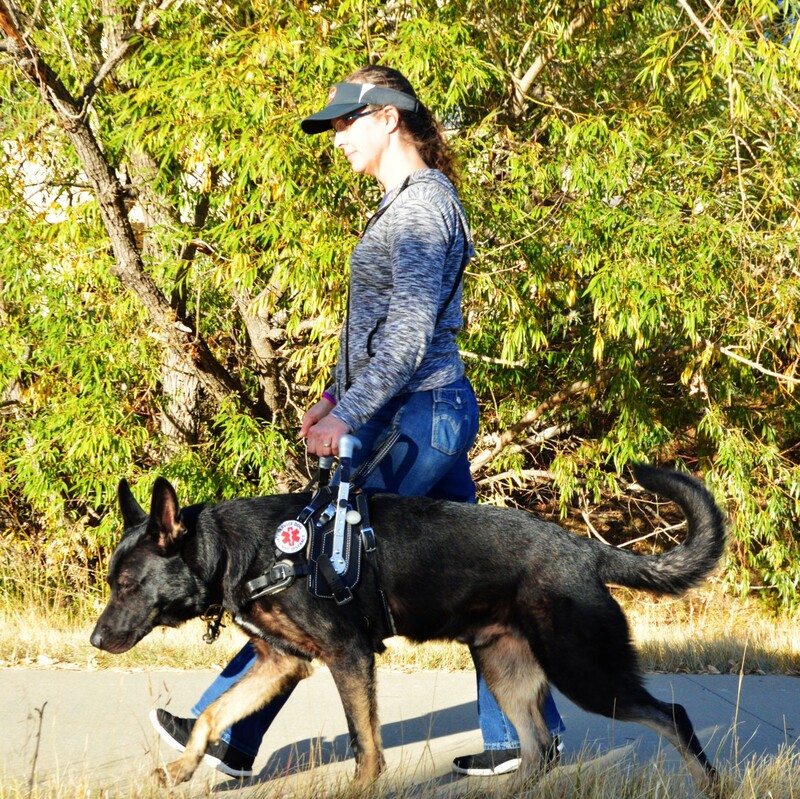 Mobility, stability, and balance assistance work is physically demanding; a service dog must be in prime physical condition. The dog’s growth plates must be closed before beginning harness work (recommended minimum of 18-24 months of age). Please allow your dog time to grow and mature before placing an order for this custom-made equipment. Consulting a qualified veterinarian (orthopedic specialist or canine sports medicine physical therapist) is highly recommended for all service/assistance dogs that perform physical tasks. 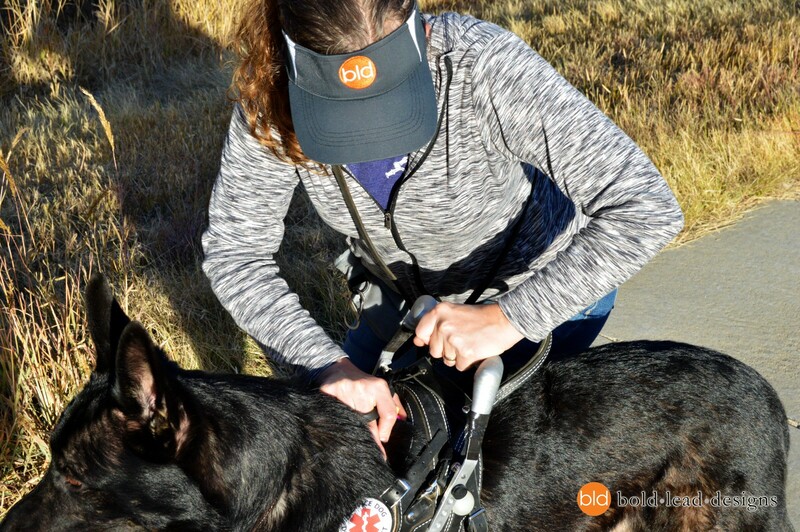 Fit and performance of the equipment can only be assured if the dog meets the minimum recommended standards, the user and trainer have reasonable expectations, and when the equipment is used responsibly for the purpose it was designed. Likewise, harness users should consult a physician and physical therapist to determine what medical equipment is appropriate for their needs. 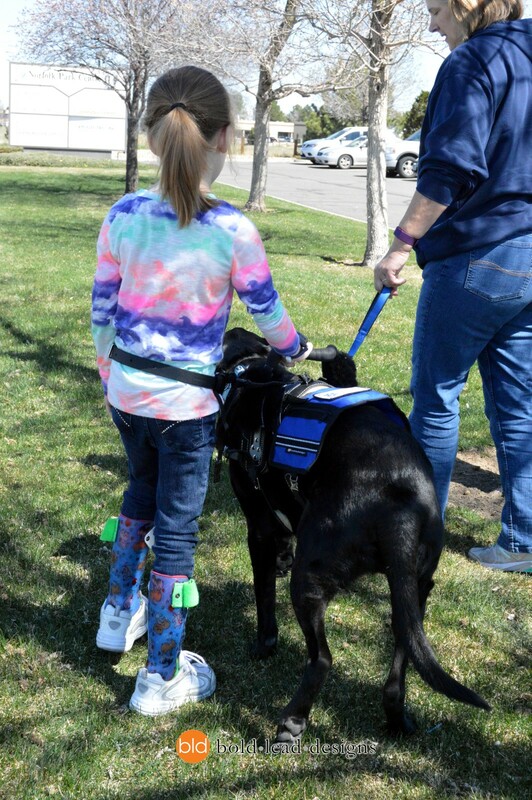 Our equipment is designed to allow an appropriately selected and trained service dog to reasonably assist a person with a balance or mobility impairment. BLD cannot assess a dog’s suitability or appropriateness. 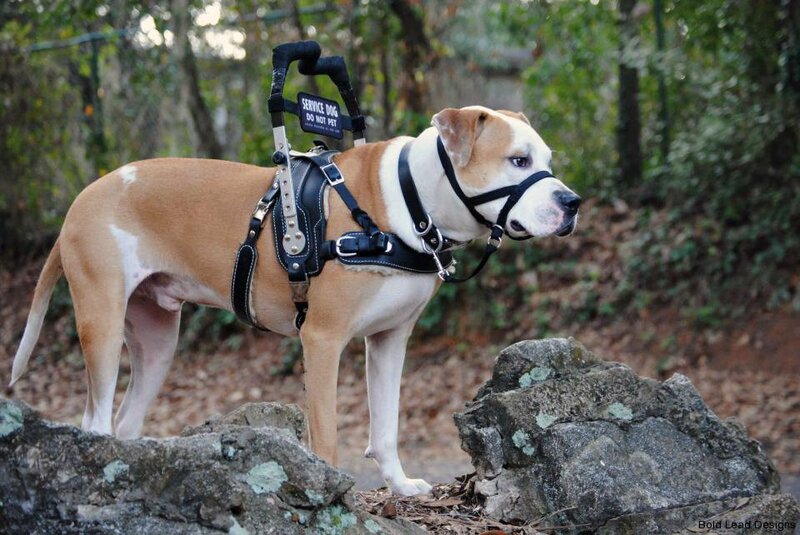 BLD harnesses are not intended to serve as, or to replace, a durable medical device such as a cane, walker, or crutch. User assumes all responsibility for the safety, health, and care of the animal and human alike. My dog Bear and I love your harness so much! We got the mobility/guide dog combo one. This is just what I needed since I am going blind and have bad balance to boot! 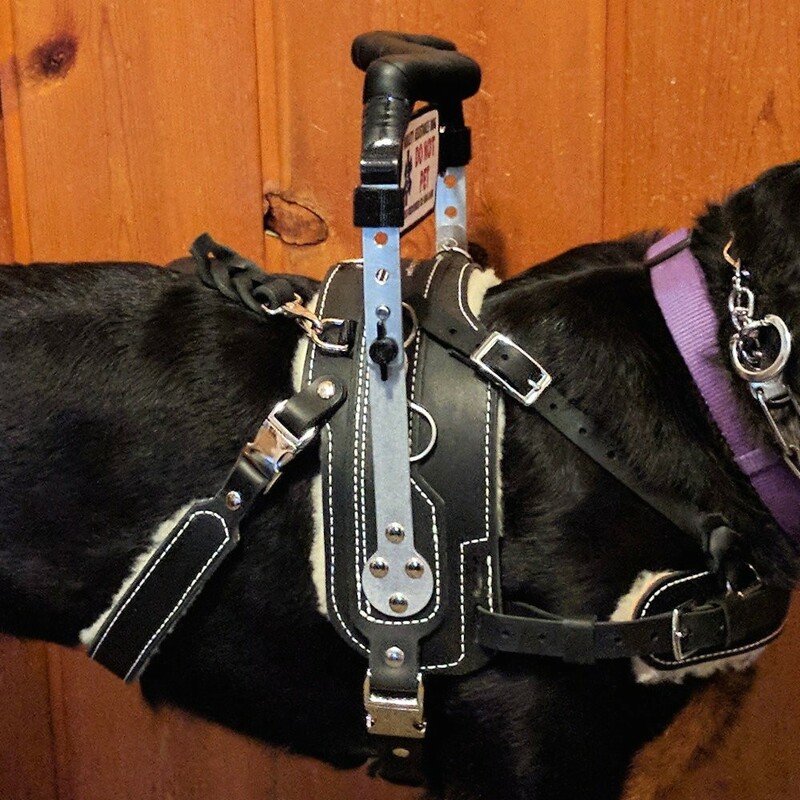 I know a lot of guide dog owners who have been asking about this harness since it allows for both handles in a totally safe way for you and your dog. The workmanship is top notch and its very easy to adapt the harness to your own capes and things. 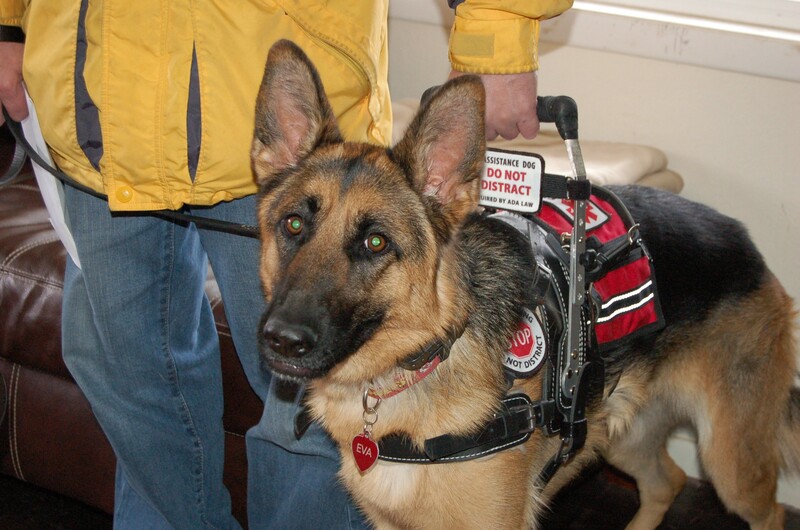 I bought the two sided Medical Alert patch and have that on my mobility handle along with my Mobility Assistance Guide Dog Do Not Pet patch. People really see it. I don’t have to wait for them to come close before they move over for us. We also have a belt lead and wheel chair attachment. 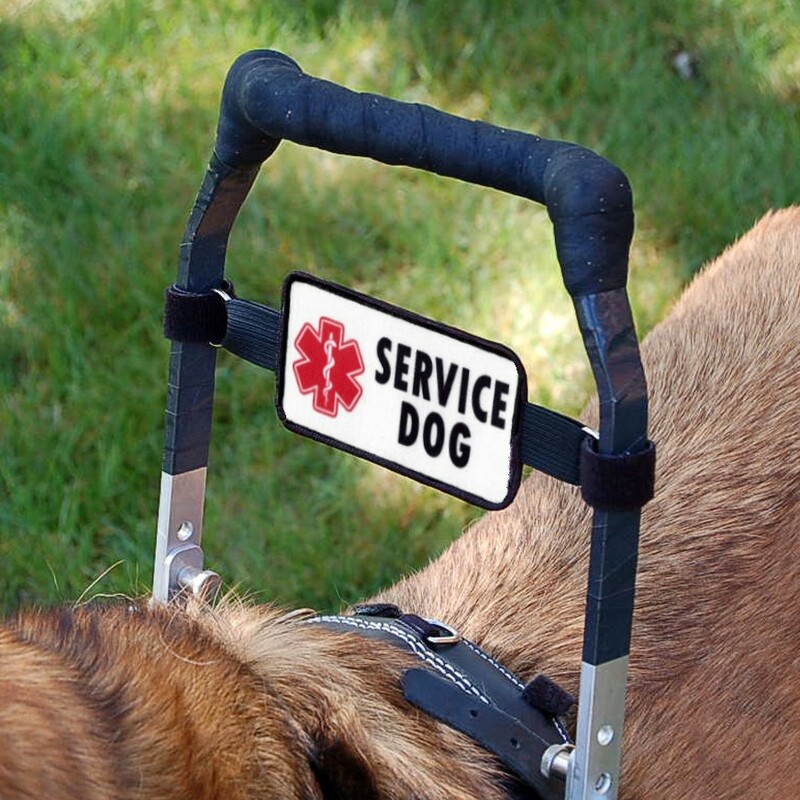 These make life so much easier for someone who needs a Guide Dog and still walks with a cane. Everything we have bought from BLD is wonderful. We love our harness, it works great . And has made my life much better . Thank you for such a quality product. The time you spend getting this right the first time, makes a difference. By far the best mobility harness I’ve used. I love it! This harness on my dog gives me all the support I need to walk safely without a cane. I actually feel more stable using the harness with my dog than relying on the cane. It didn’t take my dog long to get comfortable, so much so that he frequently naps in it during his down time (i.e. on the train, at church, at the movies, at restaurants, etc.) while I’m sitting. I’ve had my harness for a little over a year now and it has held up great! Thanks so much, this harness is a godsend. After trying other manufactures an it taking me up to 45 minutes to put the on, I can truly appreciate the Bold Lead harness. I can put it on Jack in no more than 2 minutes, on a bad day. It is as or more or as stable than other manufacturers and definitely a far superior quality. As with anything in life, we all have something that we would add that is just for us individually. 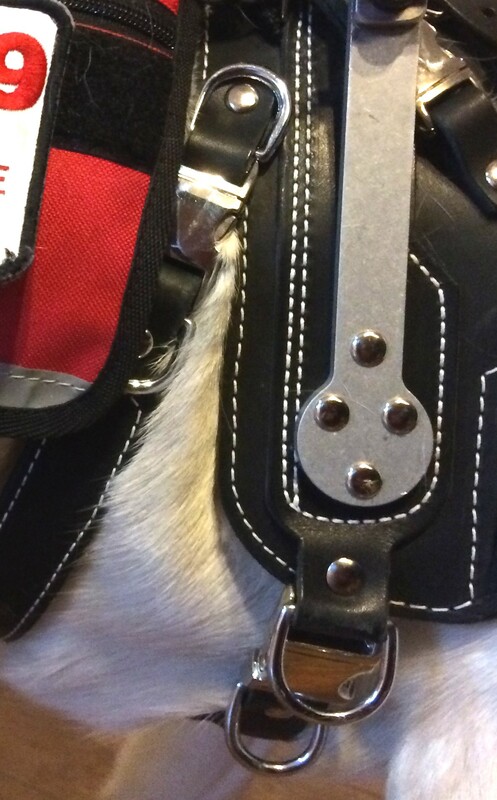 For me, I would like to see a small leather strap that would clip between the pins to lower the handle, it would just make it easier for a one handed person to raise and lower.. With that said, I couldn’t be happier to have spent the money on a mobility harness from Bold Lead Designs. Even now with the budget I must be on, it was so worth the sacrifices! The harness is a great product. Product was delivered when we were advised it would be delivered, great staff to answer any questions and the harness gets raves itself, great product!! Over the last several years I have been working with, the owner Katrina, and have watch them grow from a small one person operation into a now huge work facility. They are dedicated crafter and, in my experience and in my opinion, Bold Lead Designs are experts. 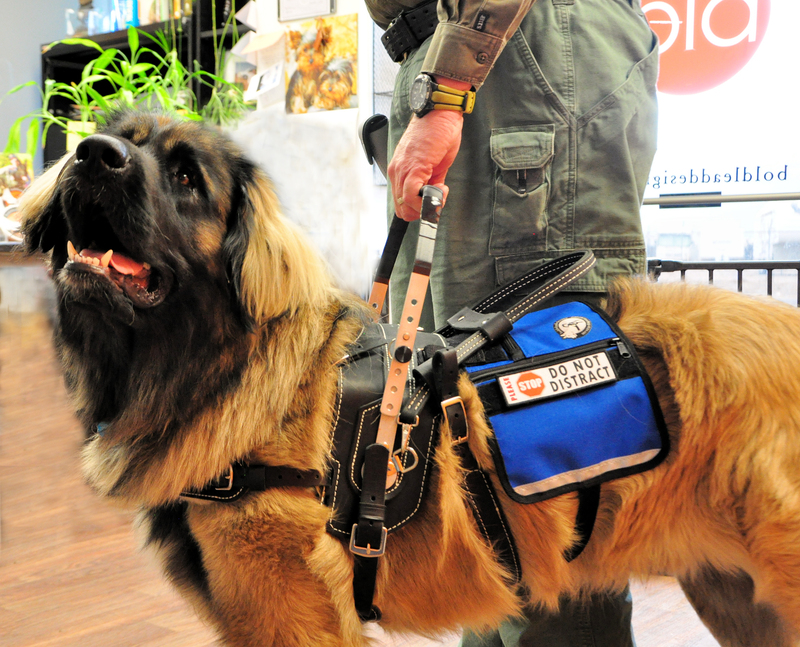 The majority of their work is custom made service dog harnesses, but they have a variety of interesting and intelligent other service dogs, reqular workin gear, as well as, leashes, collars, toys, and other specialty items. All their items are hand made with exeptional quality in both design and functionality. BLD stands by all their products and provides excellent customer service! In example service and other working dog harnesses are custom made for each dog, this provides them and the handler comfort and safety. They offer various designs, and each can be customized to what the clients needs are…THESE ARE NOT MASS PRODUCED OFF THE SHELF PRODUCTS. The old saying that you get what you pay for means exactly that with BLD, Katrina, and her staff. 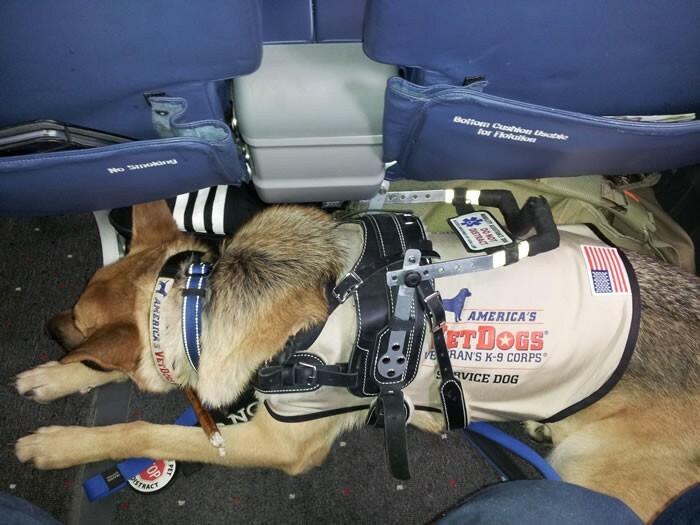 I have never had a problem with fitting any of my service dogs or in training service dogs with a BLD harness….because they are just that good, and when properly mantained they last and look the same way they did out of the box. Katrina backs up the BLD with a garantee. My first harness I bought from Katrina, looks the same way as the first day it arrived over 8 years ago and my dog SD/SAR Kayla would tell you it excellent. When the harness comes off the wall, she gets excited to this day and goes directly into “business mode”…. 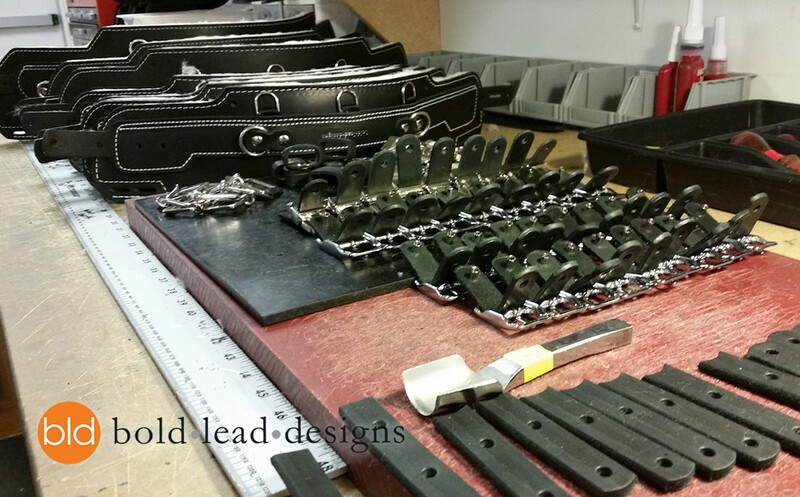 I have alot of BLD designed products, leashes, collars, etc. they have all are excellent and some are very unique items only BLD makes. But requardless of what is made, I don’t even have to question that I would give a 10 star rating if I could, but since the highest rating is normally 5, I will give all their products a 10 regarless. 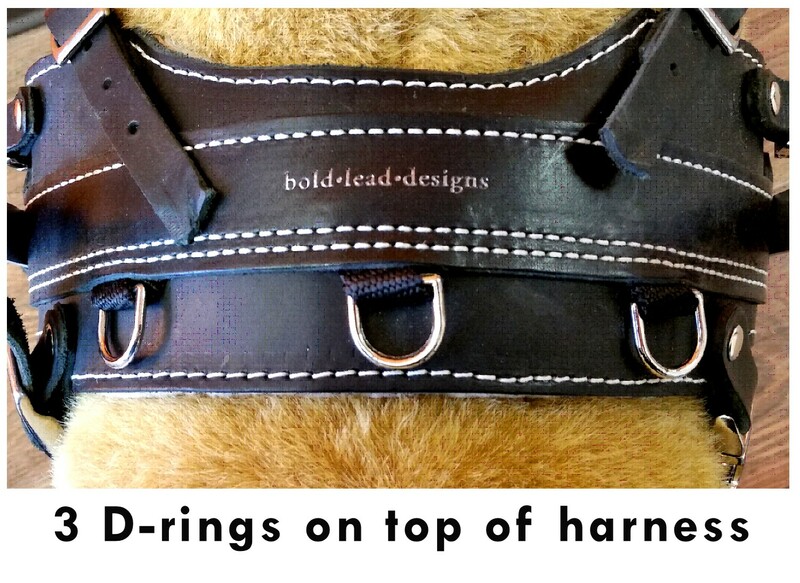 I highly recommend Bold Lead Designs, with out question….you need a harness, BLD should be your first choice. Typically since the harnesses are custom made for your dog, this does take some time to build them to your dogs measurement, but its worth every penny and worth the waite to get the harness. 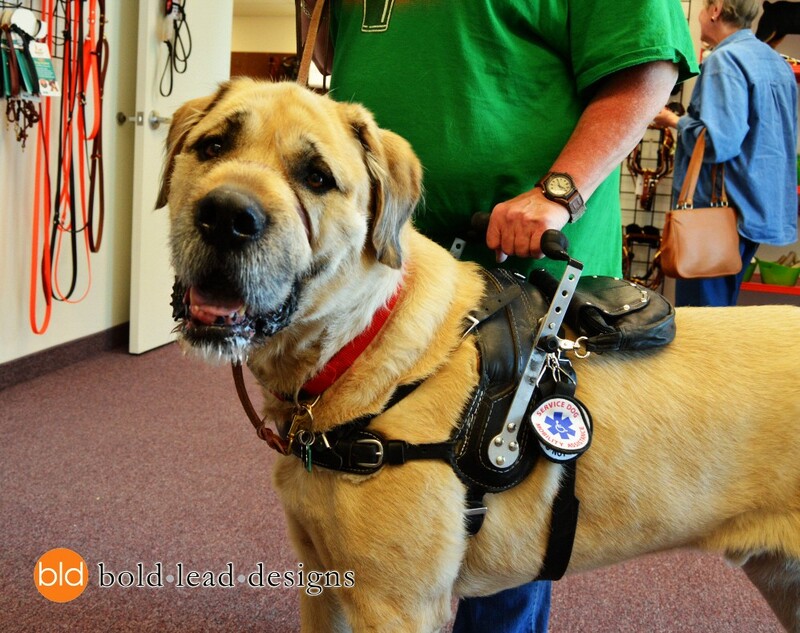 So if you are thinking of purchasing a harness for your service dog, I highly recommend Katrina and Bold Lead Designs..! If you have a problem with any of the products that you purchase from BLD, the provide excellent customer service, they are polite, efficent, and solve the problem quickly. As they function on quality rather than quantily, they are experts, and all tallented harness makers, and makers of other fine equipment! You cant go wrong with the best equipment available! If it were possible to give more stars I would. I had been researching over 6 months for something that would make working with my guide dog safer due to my neurological challenges. The guide dog school I graduated from sent trainers to my home to assist us with balance trainging. Even with the modifications I was still unstable on my feet at times. I would cancel appointments and social engagements chosing to stay home beacause I was afraid of tripping and falling. I emailed and called Katrina relaying my challenges and questions. Katrina took the time to personally speak with me and answer all my questions. 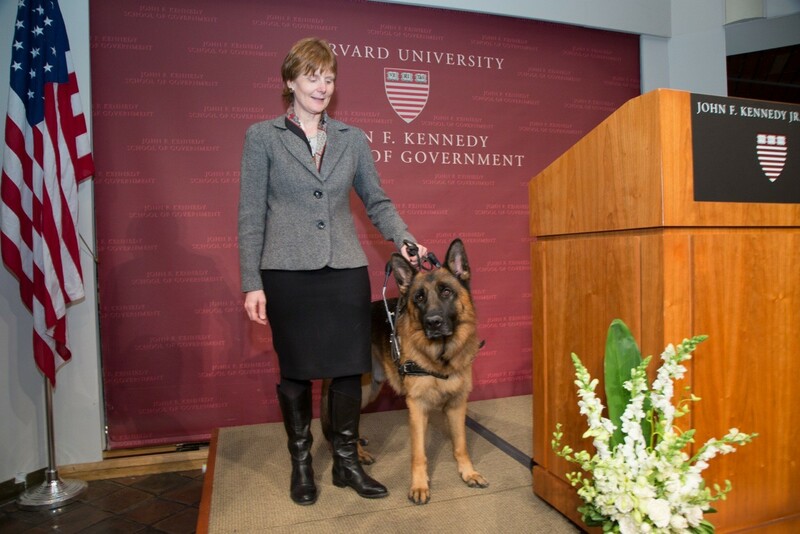 She also worked with my guide dog school educating them about the harness with guide handles abillities. The guide dog school was cautious but interested in looking further. Katrina graciously sent a demo harness with guide handle to the school to test out. Of course they were just as happy as everyone else who uses thie BLD harness and guide handle. Now I am the proud owner and user of a BLD mobility support harness with guide handle and couldn’t be happier. I am confident that I no longer need to cancel appointments. My guide adjusted to the new harness easily. I had originally been concerned with the transition to a different harness but I had worried for nothing. I had created a tarining schedule once I ordered the harness. My goal was to have us ready in a month to transition to the BLD harness full time in a month. Well, we didn’t make our goal we surpassed it. After introducing the new harness we haven’t touched his orginal harness. We exclusively guide with the BLD mobility support harness with guide handle. This product is of exceptional quality, made to order, with the best customer service imaginable. Don’t hesitate to inquire about the products. This has been one of the best purchases I have ever made. Without any dout all the items that i have bought from BLD have been fabulous, and my service dog loves them, our first item we bought was the lead, having not long been teamed up with my service dog at the time i wanted him to have a real leather lead like his buddy’s that were guide dogs , i searched and searched but could not find one in my town, so i went on line and BLD popped up , there prices were great , i bought the lead and a few weeks later it arrived , the next item i bought was the MSH as my balance had been getting worse over the years, this one was a item i gave much thought to after looking in to it extensively i found it would be safe and beautiful for my service dog , i love how it gives the illution of being big and heavy but in reallity it’s super light, yes the rib cage strap that was sent with it was to big but after a quick chat with the BLD staff, a smaller one was sent free of charge and i sent the large one i’m guessing was an XL back to them no issue, when the harness arrived on my service dogs birthday 10/2/15 this year it was beutiful it also included some lights, and to my suprise a water bowl had been added, i don’t know if it was just a little some thing extra as a thankyou from them but it was very sweet, I am still waiting on my final order so i hope it come soon BLD has sent it so it’s some were in the post. Like most people, I was very nervous about spending so much money. When I placed the order, the people are so kind and patient – answering all my questions while getting all the information that they required. When the Harness arrived, I was thrilled beyond words…I definitely got what I paid for (and more)!!! The quality and workmanship is apparent from the moment you take it from the box and place it on the dog. My new Mobility Support Harness fits like a glove!!!! Thank you One and all from the bottom of my heart…Reaper and I are mobile and loving it! From start to finish, the BEST experience and one of the best purchases I have ever made! Thank you, Thank you, Thank you. Absolutely outstanding product & company! From the easy order process, to questions about my Service Dog’s custom measurements– the whole team make it such an easy and seamless process to order my Great Dane’s BLD. They shipped it a week sooner than I had even expected it, which was SO NICE! After three different phone calls that I made to them, to make sure that I was measuring my dog correctly– when I received his harness it fit TRUE TO SIZE. Thank you BLD for making such a fantastic, lastly, and life changing product. We give you 5 stars and 2 Paws Up for being a company we can trust, that has the best interest of its clients in mind. 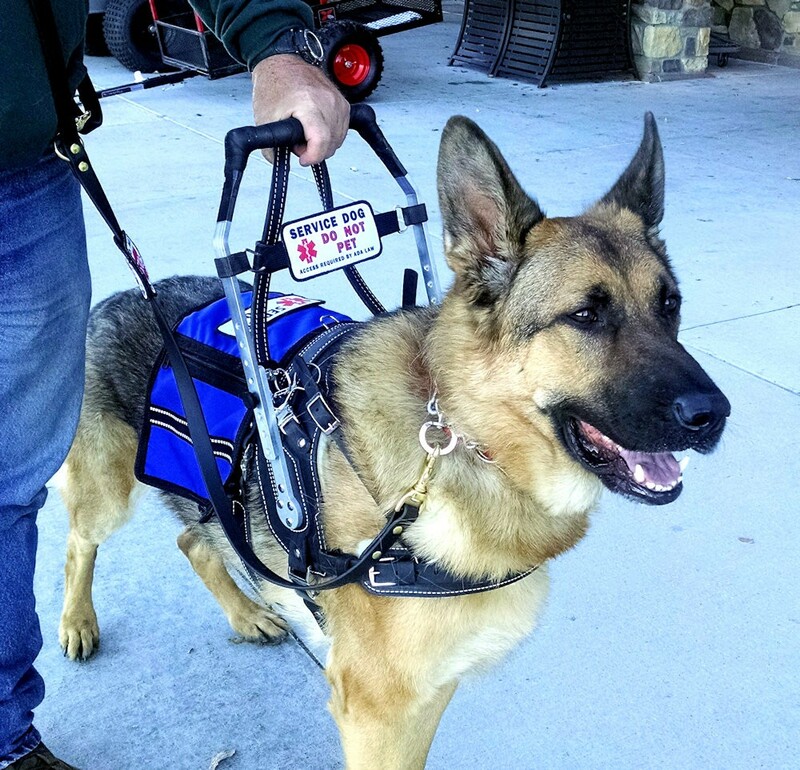 Kindred Spirits K9, Service Dog Trainers (out of Vista, CA) helped me to purchase this harness for Brody and myself quite a while ago. It has been wonderful! I have the standard handle since I have to switch sides, both for my physical needs as well as some of my visually impaired students’ needs due to which hand they use for their cane while being guided. Brody took to it immediately, strongly preferring it to the soft harness we were using, since it made the sudden movements easier for him to counter balance, and easier to quickly switch working side. Even after Brody’s long days of wear, he never has a sore or tender spot and always asks for our evening walk despite knowing he will have to put the harness back on. Like a saddle, it has formed to his body perfectly making easy to place and fasten. I did purchase extra knobs since I misplaced the extras sent with the harness originally. The harness looks as good as ever! Would never get any other company’s after having this one! 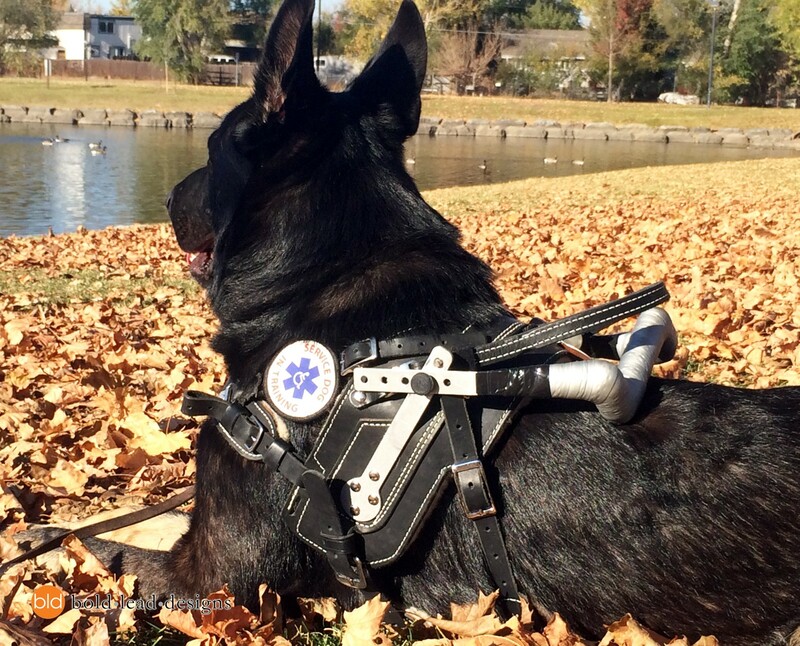 The absolute best mobility harness on the market! Stable, easy to use, beautiful, durable, multifunctional, and most importantly, safe and comfortable for the dog (if used correctly). Definitely worth the price! I was worried about spending so much online without seeing and feeling the harness in person. I was worried about the measurements I took were not correct. I was worried about everything that could go wrong. All those worries were proved imaginary and useless! This harness leather is better than expected! The workmanship is Excellent! The measurements were tweaked so if Bravo lost or gained some weight the harness would still fit! 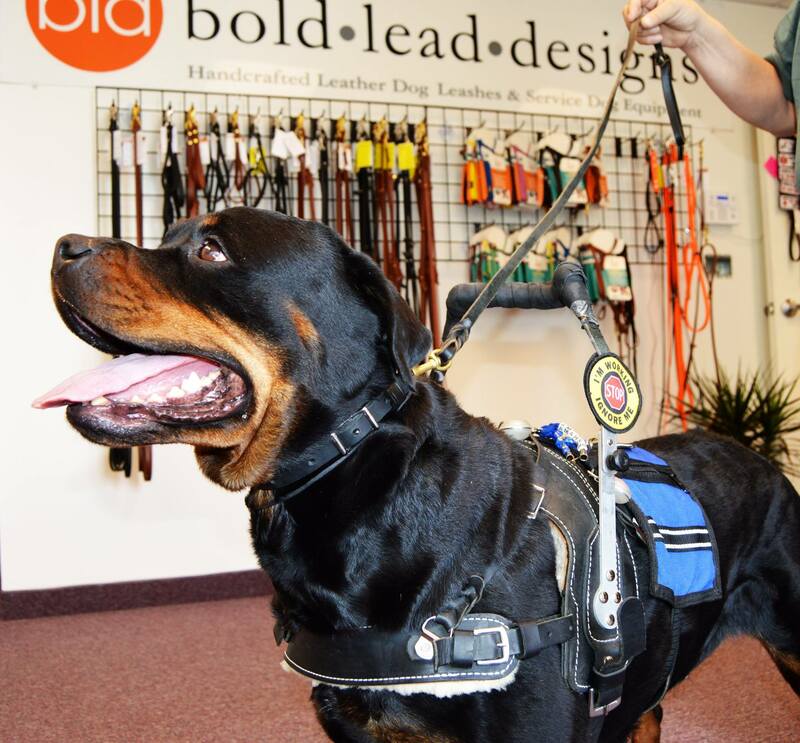 The people at Bold Lead Designs were Wonderful to talk to and helped me make some last minute decisions to make Bravo’s harness perfect!! 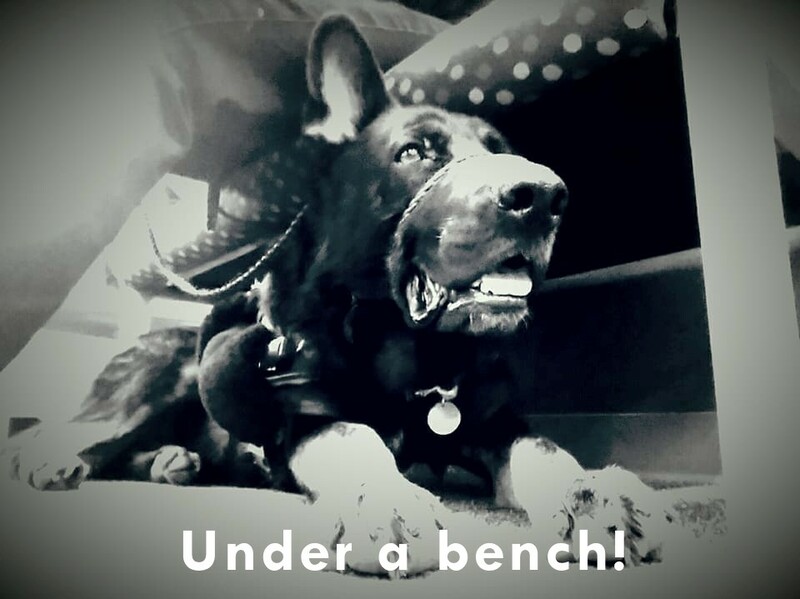 Bravo hated his old service harness so much he would hide under the table. With this harness, he puts his head through and stands still to get it latched. With one body shake, he is ready to work all day if I need him to. The harness fits so well and comfortably on him, my worry of harming the dog I depend my life on is gone! 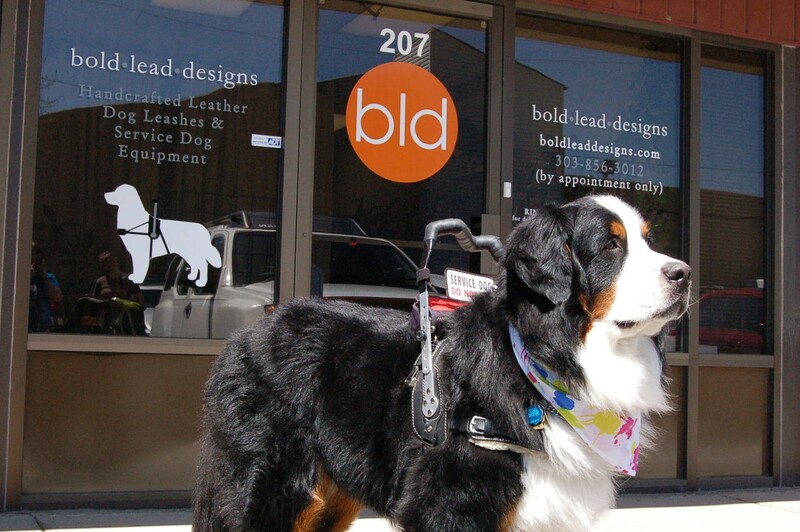 :) Thank you so much, Bold Lead Designs, for having an Excellent product and for Loving to make Dogs Comfortable (and the handlers Worry Less)! I wish I could give to 10 stars or more! I love this harness, it is extremely helpful. It is sturdy and easy to put on. I like how it folds, it allows me to put it on a shelf when not in use. I also have gotten great customer service, any time I have a question I can call and speak to someone who is always able to answer all the questions I have. I bought a BLD Harness several years ago after a lot of research. (My MS had progressed so I needed more support than the simple vest with strap handle I had been using could provide.) I received great assistance from Katrina herself. The BLD harness met up to the promises made. I am able to easily balance on it. Brindy (my Staffy/Rottweiler cross) has worn it weekly for years now and it remains both functional and comfortable for both of us. During church services, Brindy sleeps comfortably in it. The workmanship is excellent. I especially like the easy-to-use clasps. Since the two are different sizes, it is easy to know which strap you are fastening. I had one problem when I first received the harness. One of the leather adjustment straps was not sufficiently stiff so that I had trouble unbuckling/buckling it. BLD replaced the unit that included it without question. Great service. 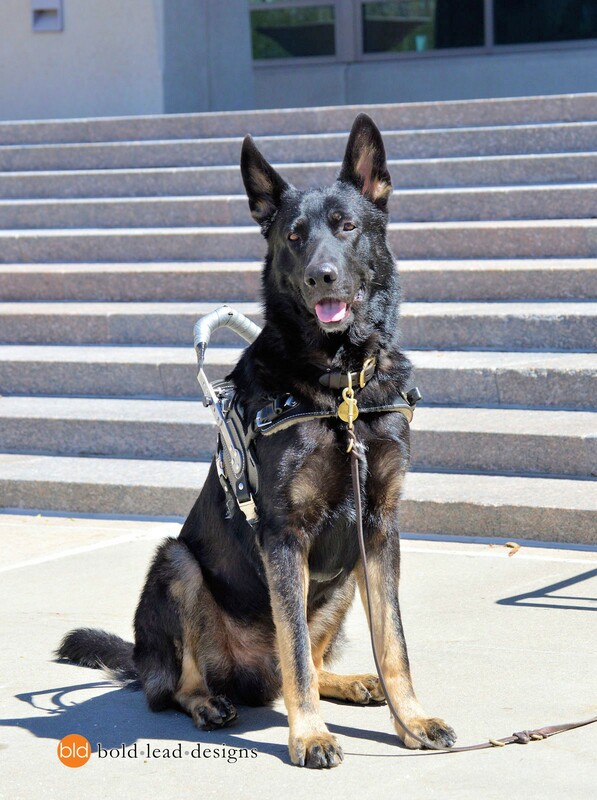 I was in the process of obtaining my new service dog when a veteran showed me a picture of this harness. I made arrangements to meet him at an event where I could inspect one up close and personal. I thought this harness might be just a little pricey, but when I saw it in action I knew I needed one. Taking measurements was easy and harness arrived just ahead of schedule. I have been using it about four months now and it is exactly what I needed. I am able to keep my balance with very little effort if I stumble. I am helping train a dog for my best friend and when she is ready I will order one for him too! 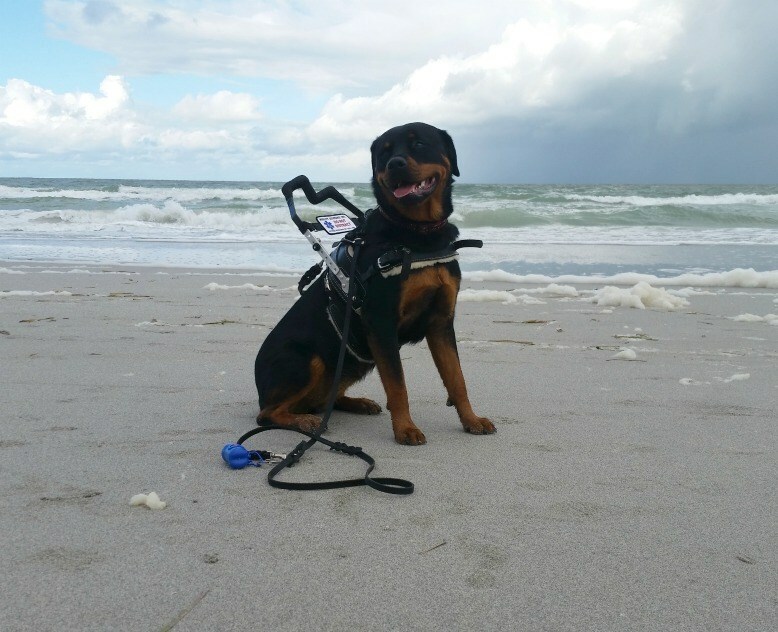 I am so happy with my choice of the Mobility Support Harness with Guide Handle. My dog loves it and its taken Bear from in training to a full Assistance Dog. Guide Dogs UK has had a mobility trainer here to teach me long cane and he was very impressed with the harness. I get asked all the time online where to get this harness. 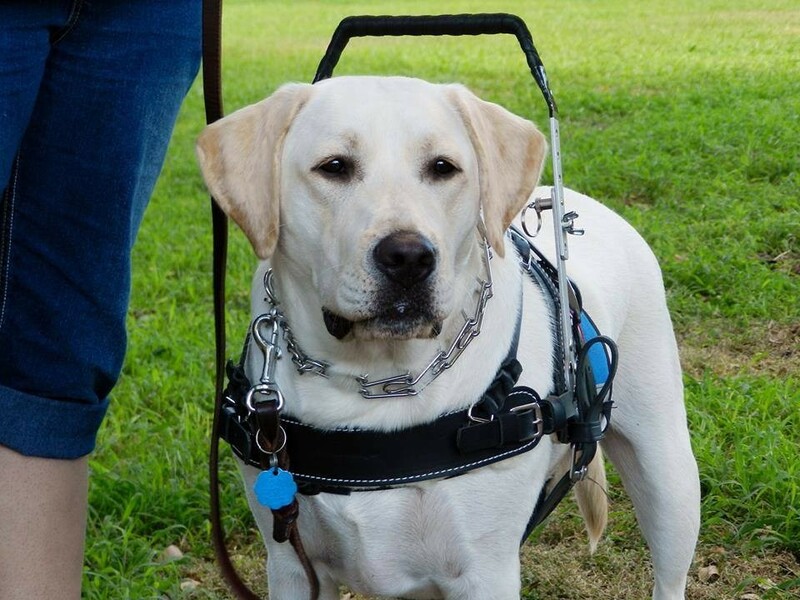 I have also joined a guide dog page with mostly UK users and I have gotten nothing but impressed inquiries. It is so easy to use and really makes me feel comfortable in places that make me dizzy, like the supermarket. Having the extra mobility handle along with the guide handle is a dream. Thank you so much for making it and thanks for the wonderful customer service. I used this harness for over a year before my condition changed and it was no longer useful for us as a team. It was comfortable for my gear sensitive dog, well balanced and held up to a lot of abuse and when I gave it to another team it still looked like new. I love how well it fit right out of the box and the leather is the best quality I’ve found on the market. Thank you for wonderful products. Let me start by saying that Katrina makes the best leather works out there. I bought the Infinity lead head collar the leather one as as some other cleaner. 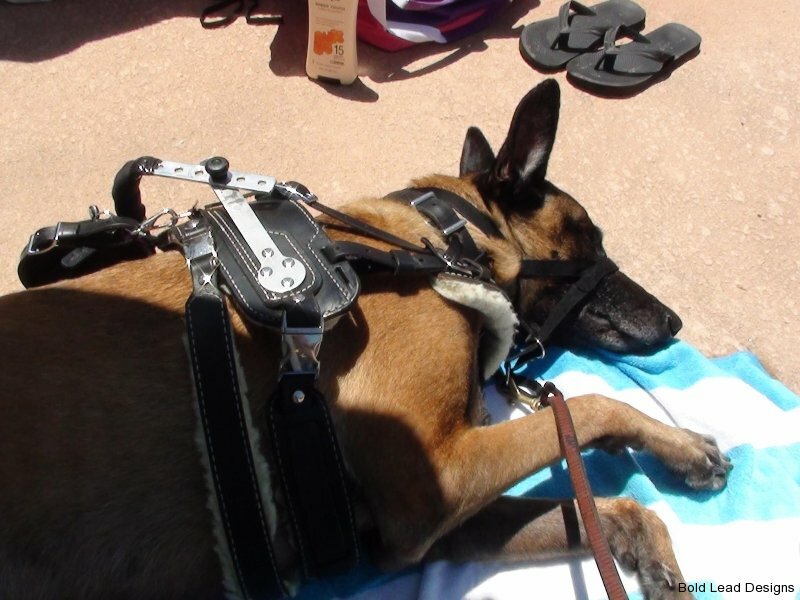 But the best decision I ever made was to buy the mobility support harness. It’s really comfortable for my dog as as for me and very stable. Since I bought the ergonomic support handle, I had not had any falls and my balance keeps improving from using it. Before I bought the harness I almost decided to give up on having my dog be my mobility support because all the other products I’d bought were not comfortable for him and not stable for me. But after I bought the harness my whole life is changed. This is coming from somebody that’s never been able to walk unassisted. I’m very grateful for Katrina and your company and I hope she keeps doing the best work possible. Their service really cares about your dog. I have a 15 mo old GSD that I needed a harness for but she is still young and I was worried about her growing and what size would be best for her. Now they could have just sold me the harness right then and there BUT they told me that I should wait until she is about 2 when her growth plates close. 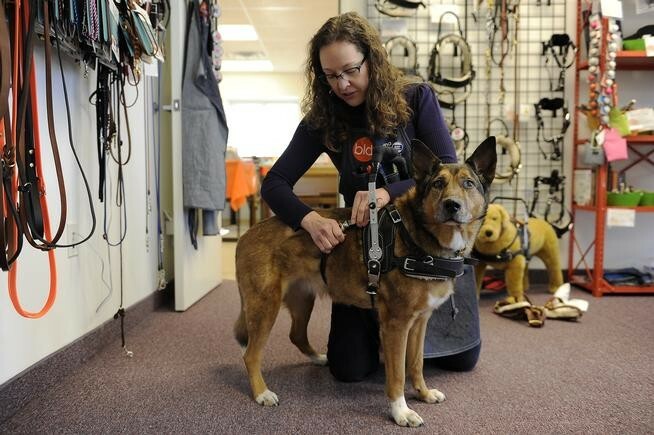 They not only have great harnesses but they really Care about the dogs they make them for. I will be ordering in May when she is 2. It was NOTt about the money to them it was about my dogs health and me. How can you not trust someone like that!!! Worth every penny. The harness we had before this one was stiff, heavy, and had these impossible buckles that were really difficult for my rheumatic hands to fasten and unfasten. Gordon moved slowly when wearing it and tried to run from me when I needed to put it on him. Also, the handle didn’t fold down, so he banged into everything all the time, especially when he went under tables in restaurants, etc. Enter this harness from BLD. We followed the very thorough measuring instructions, sent our order in, and were really pleased with both the turn around time and the communication. When it arrived, we thought it was beautiful, and the quality was apparent. The first time we put it on Gordon, we could see the different immediately. He had a spring in his step when he walked, he moved much faster, and he stopped running from me when he saw his harness. He is so much happier in this one. I especially appreciate the ergonomic handle, the sheepskin padding, and the fold down handle features. But the best part are the buckles. Yay for buckles! 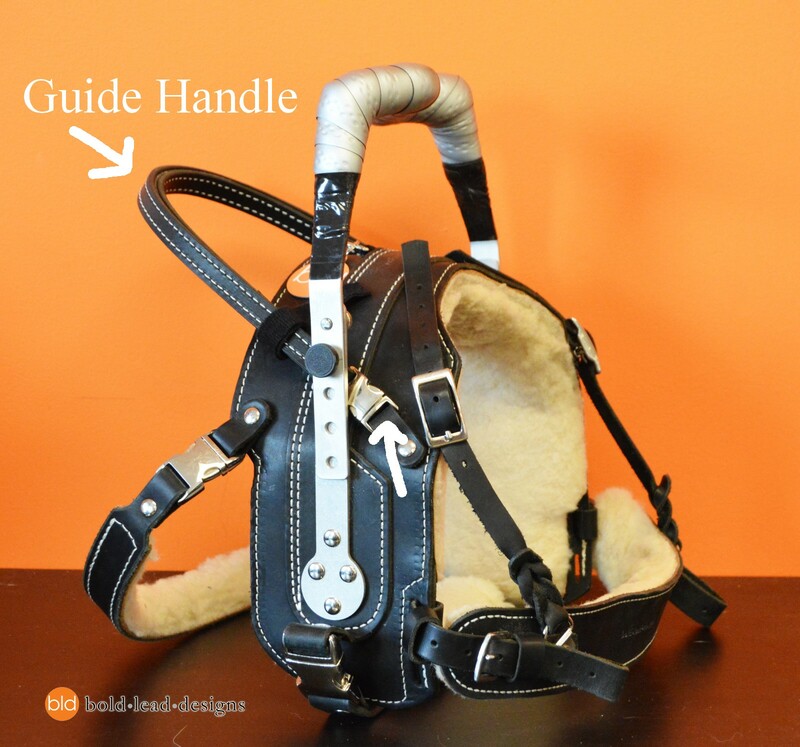 The design means there’s nothing for Gordon to have to step through or for me to have to pull his legs through, and the buckles are a gift to my hands, which some days don’t work so well. I love my BLD Mobility Harness. More importantly, my assistant loves his harness. He’s always excited to see it, the leather is soft and pliable, it fits perfectly and we’ve never had any issue with chafing, sores or hair loss that I’ve seen from some other ill fitted cheap harness. This harness is not cheap, but you really do get what you pay for. I love the new lower profile handle bolts and his vest is the perfect accessory for carrying the all important doggy bags and wet wipes. You can really feel the love and attention that went into making this harness and I thank your for your craftsmanship every time we use it. My daughter has used this product with her service dog for over a year. It is well designed and works awesome for the two of them. Love the fact that it is built totally to their measurements and for them alone. My daughter has been given the opportunity to live more independent thanks to this harness. 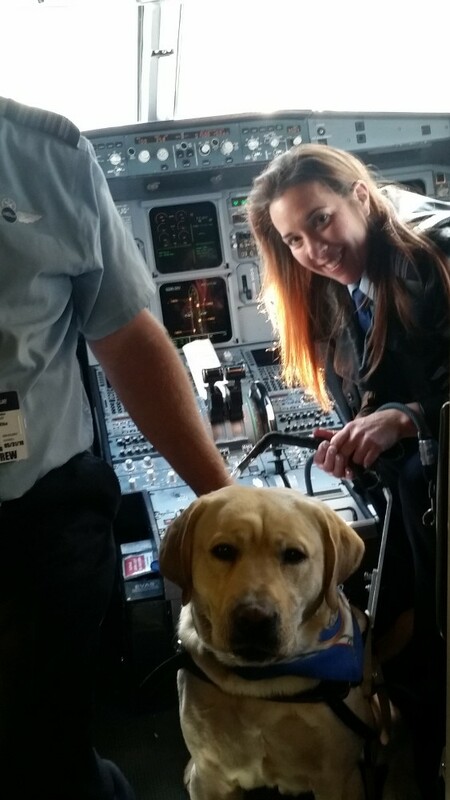 She and her service dog lives right on campus in the dorms and attends college together. She would not have been given this opportunity if it were not for Bold Lead Designs. I am also so impressed with not only the looks of this harness but the fact that it is so comfortable for her dog. It has helped me as her mom to be more at ease in this stage of her life. Thank you Bold Lead Designs!!! 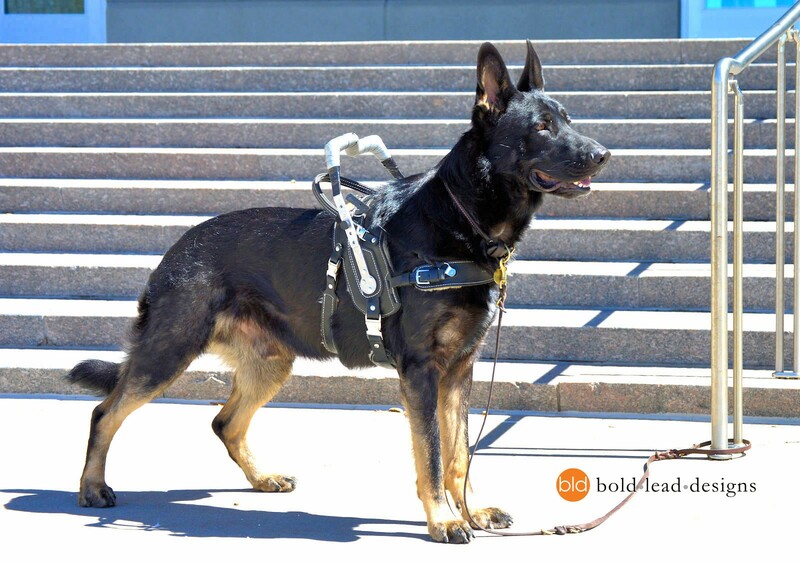 Purchased a mobility harness for my wife’s service dog (aka Booone the wonder dog) We couldn’t be happier with the quantity of products and customer service we received from Bold Lead. Would highly recommend (and have) to anyone who wants only the best for a dog that unconditionally gives their best for their partner. Thanks Josh, and the whole crew at Bold Lead Designs. 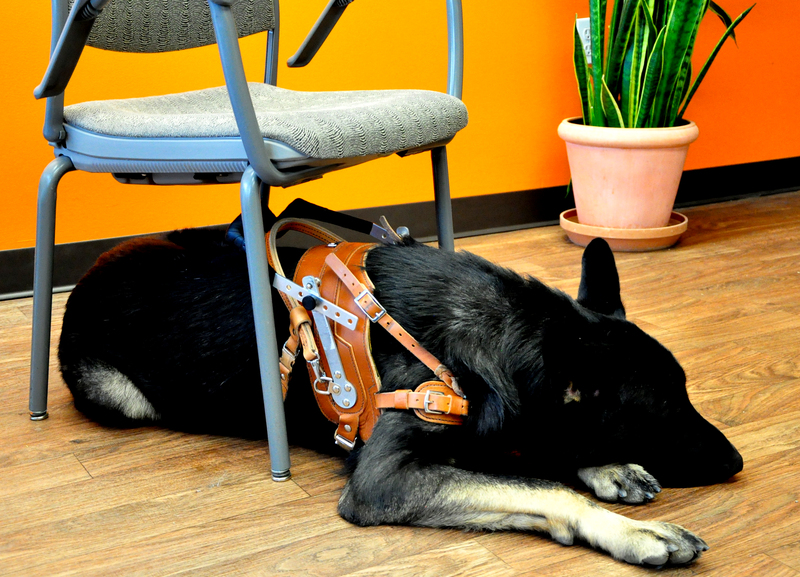 Katrina does outstanding, super top quality leatherwork on her custom made Service Balance/Mobility Harness. 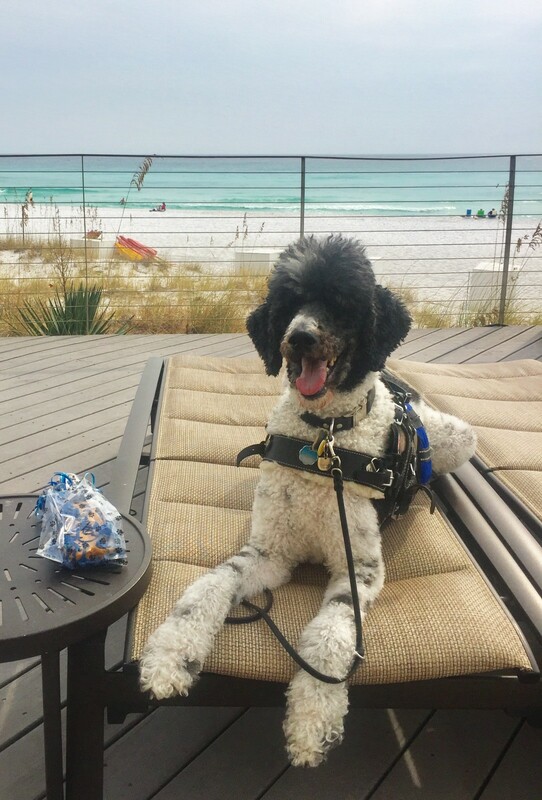 After my MS diagnosis, I prayed for a Service Dog to rescue and train…My Marley showed up for me…online I scoured for hours and days, borderline obsessive in my quest for the best harness…beyond the shadow of a doubt, this harness is the best available, in my humble opinion. 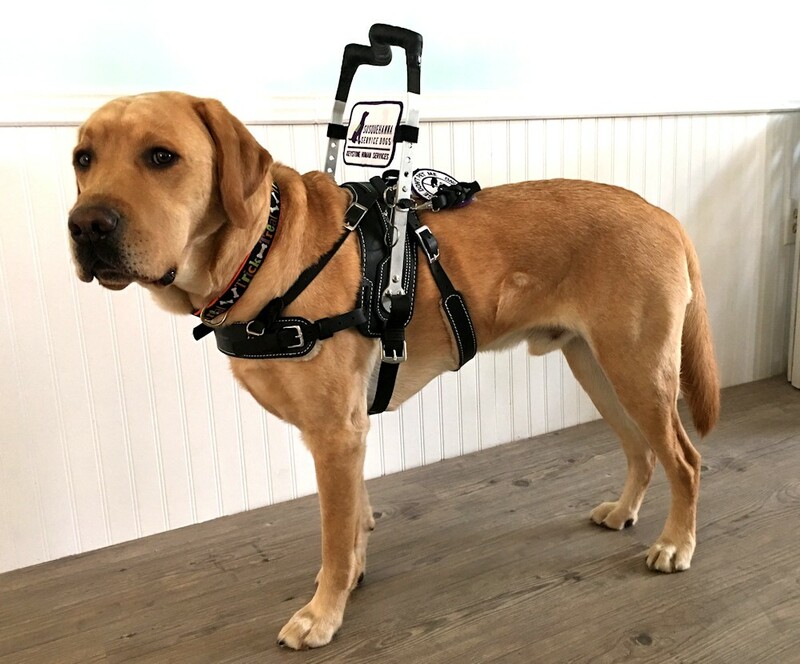 Marley is proof in that he gets excited when it is time to put his harness on…he feels special and he is…I tell him that all the time…he is the best and deserves the best harness! Zorro and I used our MSH for a few months and it was helpful. The harness was very comfortable and any issues with the harness were addressed quickly. This Mobility Harness!! is the best. Made with great leather and with care. fits my dog perfect. the harness I had before slipped to one side or the other, NOT THIS ONE it stays put. My dog is comfortable with his harness, and it is easy to remove when I am done using it., not like the other ones where you have to unbuckle and fight with the dog to stay put so you can get to the buckles. I get compliments Everywhere I Go how nice of a harness it is . customer service is the best. I highly recommend his harness. IF I COULD GIVE AN ADDITIONAL STAR I WOULD. 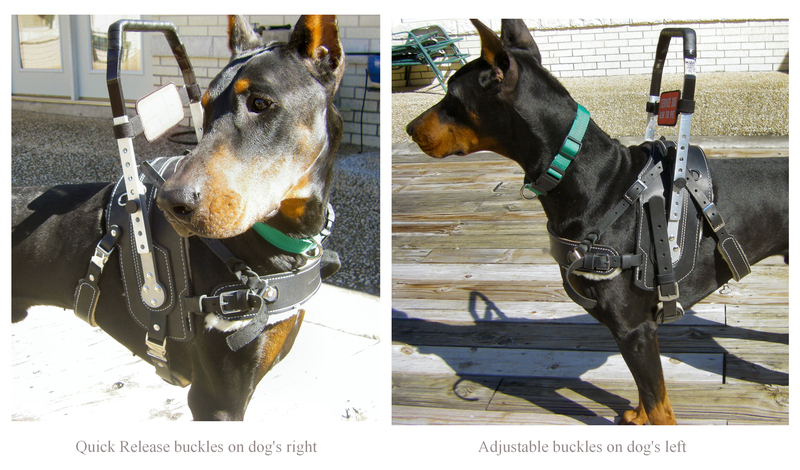 Not only is the harness a work of art, it is designed for Your dog and You. Every inch I was consulted about, guidance given and long-term considerations made. It was a PERFECT customer service experience. That said, we’ve used this harness for a few years now. 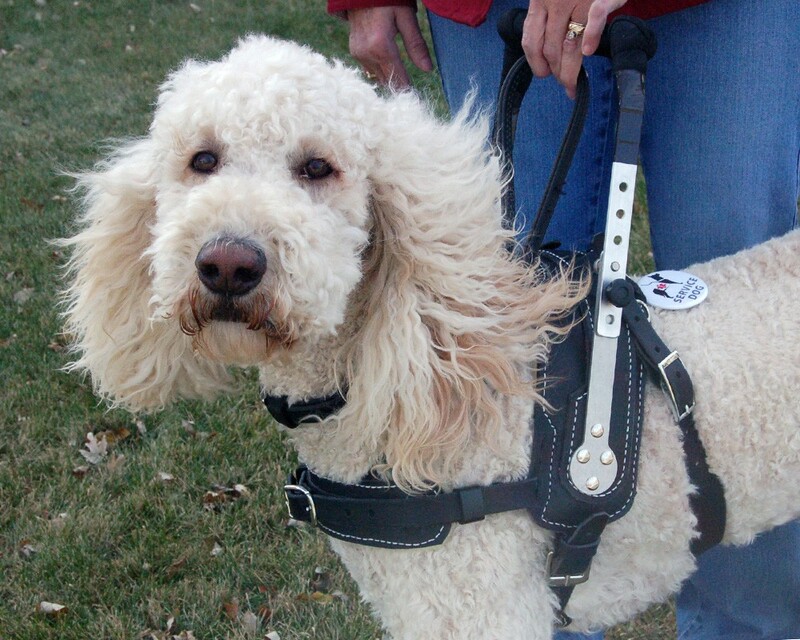 Murphy’s weight varies from summer to winter (swimming); the harness so easily adjusts. We are out in harsh weather all the time and there has been NO compromise. In fact it still looks beautiful. Murphy ‘walks’ right into the harness so i know with the sheepskin padding he is Happy to Work and wear it all day long. The hardware is smooth, functions perfectly, and seems built for long-term. 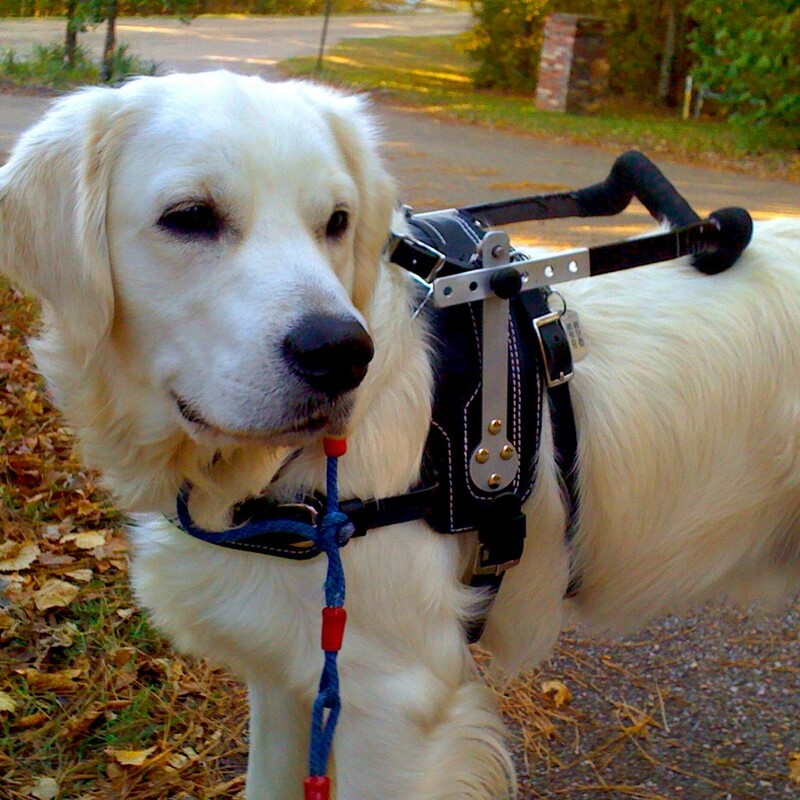 Murphy is 110 lbs – no easy PULL on rivets and latches ——–but no problem for this harness. As I said from the ordering process, the customization, customer service, and product quality – if I could give 6 stars I would. 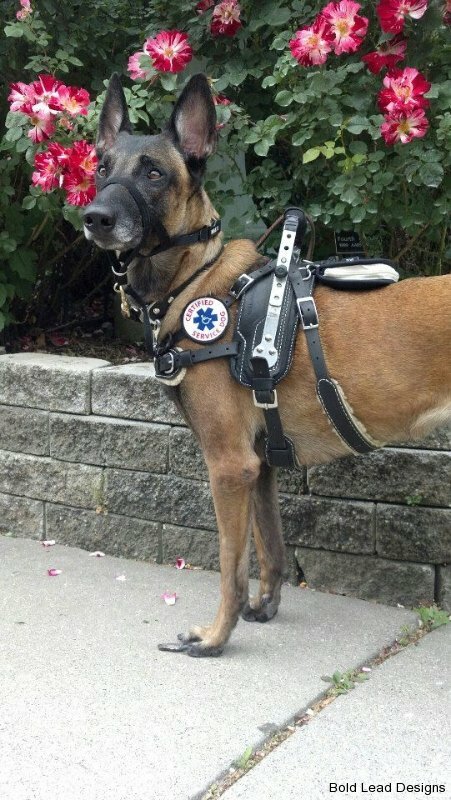 My first Service Dog got his harness in 2011 and the fit was awesome. It gave me my independence back. The fit was perfect and it was used till his death from brain cancer in 2014. My newer service dog was able to use the harness until he finally outgrew it. Someday I will have to get a new one and it will also be another BLD harness. My Lola and I love our Mobility Harness!!!!!!! Most comfortable ride out there. I tried them all. They all hurt my back. ONLY BLD harness doesn’t hurt in fact only comfort. Thank you so very much for helping me and giving me a easy, lightweight, problem free harness. Lola and I as a team feel less of a weight on our shoulders every time we go out. Pun intended. AND you guys were sweet to me even though I don’t talk very well taking our order. Thank you. I ordered my MSH about 18 months ago and it has been a pure godsend for me! Several times when I have gotten overbalanced I was able to hold the handle and steady myself instead of falling. Rachel my beautiful standard poodle is so comfortable in the harness she will fall asleep under the table when we go to restaurants, or for coffee. Rachel totally approves of the fit and feel of this wonderful harness as do I. And the over the shoulder leashes are awesome as well, I have sent many many people to BLD with the highest praise for the products. I will never buy a leash anywhere else!!! Awesome products Katrina and crew. I had been debating getting a new harness for a while. I had purchased other harnesses, they either slide around or my service dog was so uncomfortable in them that she didn’t even want to put them on. I got this one in the mail and she couldn’t stop sniffing it. I got it all set up put it on her and she acted as if she wasn’t wearing a harness. 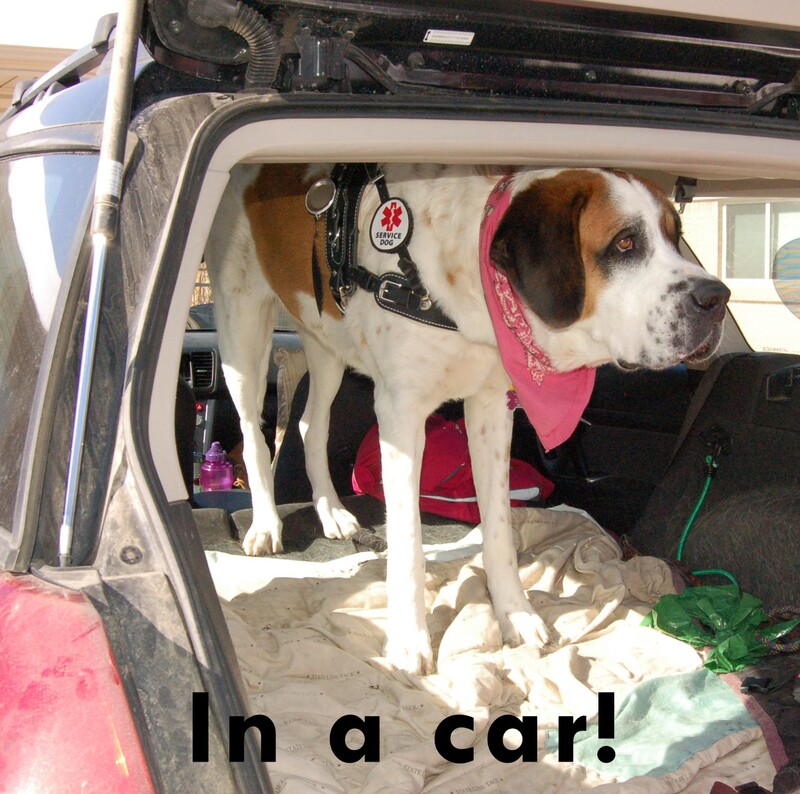 She was able to jump in the car, trot around and definitely felt more comfortable that any other harness. It was well worth the month and the mobility handle helped greatly with my balance/dizziness problems. I could feel the dog move underneath the handle unless other soft handles and was able to use that very easily even without putting much pressure on the dog. Bradley’s new harness arrived today!!!. . . It is wonderful. 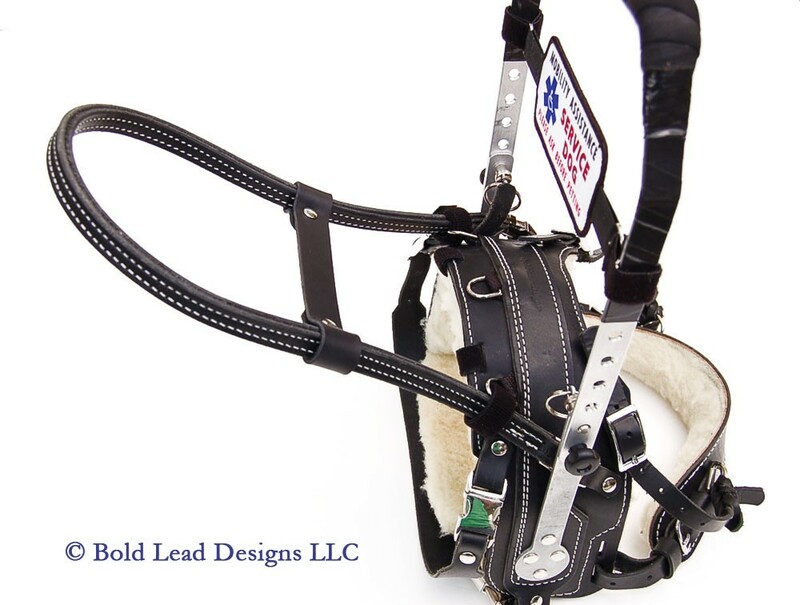 Bold Lead Designs this is the best harness Bradley and I have ever had or seen. He didn’t fuss at getting it on, he just slipped right into it. It’s well padded for him. The handles are perfect for him and for me. Your harness is the first one I’ve ever seen that has the extra strap under his stomach which makes it so secure for me. And the release buckles will be easier than anything we’ve had. The way you have the front chest straps make it better for Bradley and sturdier for me. I’m really happy. I like the release on the handle too. 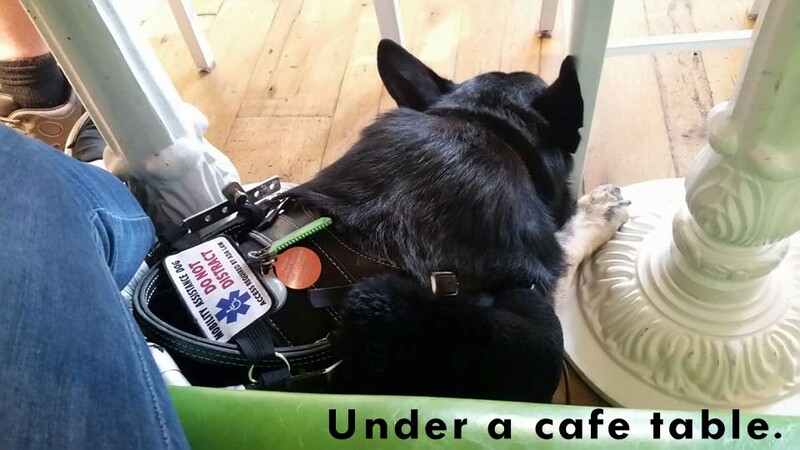 It will allow him to go under the table at restaurants and in church. This is very well designed. To All Who Crafted Mojo and My Stability Harness…..THANK YOU! The product is everything you say about the quality and craftmanship I receive- It’s one to be treasured and used with delight by us both! I am so glad that your company was accessed for my needs and the need’s of others. Best of luck and may your business remain five-star! I just wanted to say thank you for making such awesome harnesses. You really made a harness that is comfortable for Raven and me. She loves this harness and prefers to work in it even on my good days!! 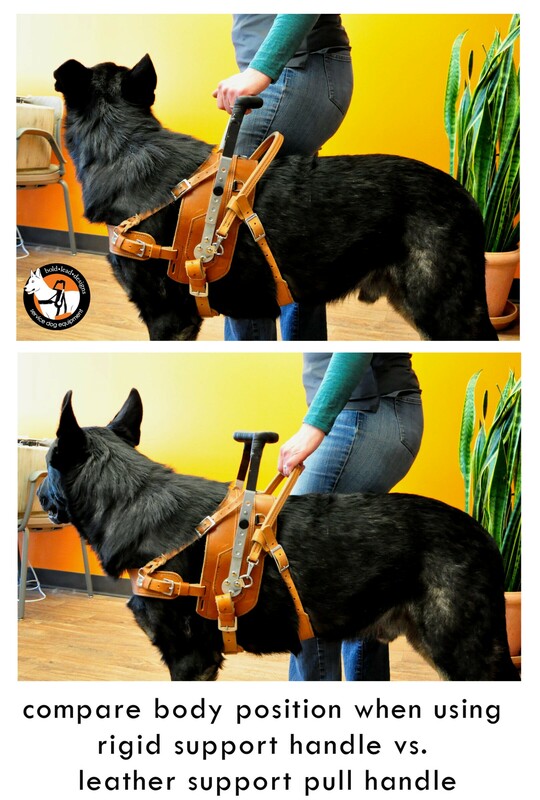 I would recommend this harness to anyone that has a mobility service dog!! Its very durable and long lasting and its great that we are able to replace parts if needed instead of buying a whole new harness!!! Thank you!!!! I wish I could give Katrina ten starts. I’ve had my harness for less then a day, but I’m already so much more confident in my balance that I can actually walk with my head up to the horizon, a first in a long time. I was blessed to live close enough to Katrina that she could do the fitting work in person, and she is just the sweetest, most helpful person I could have hoped to do business with. I’m so happy. My harness handle doesn’t shift or wobble- at all- not even a little bit. The ergonomic handle is worth the extra change, it has the perfect positioning for my hand and elbow that makes using the harness feel so natural. We did also get the cape in red and the ill strap. Maple looks professional and stylish. Previously I had another harness which made Maple harness shy and resistant to work, along with taking forever to put on. In the bold lead, maple is clearly comfortable and adjusted within hours of wearing it. I will from now on only shop and support bold lead design for all my SD needs. This is by far the best support harness ever! Killian adjusted to it very well. The harness and my wonderful dog have saved a fall more times than I can say not to mention the never ending aid in balance support. Thank you BLD for a job well done. No regreets. Will do future business!!!!! I just wanted to take a moment & thank you for the EXCEPTIONAL harness & custom leads you made for me & Emmy. Not only are the gorgeous but she is very comfortable wearing it all day. I have had many people comment they have never seen anything like this & what an amazing thing for people who have mobility challenges. I have been in & out of the hospital with my Mom the past several months & literally no one had ever seen this before. The physical & occupational therapists asked lots of questions so hopefully more people like me can get out in the world again & “have a life”. Everyday I walk with Emmy & my harness I thank you from the bottom of my heart for the freedom & ability to go places without my cane or walker.I LOVE both the quick release collar and locking jaw snap on the leads. It makes it so easy to get on & off as well as change lead length from walking to resting.Again, so many things to be thankful for this year & finding you is at the top of my list. I’ve looked at every mobility harness made and this is the best quality harness there is on the market. The quality of the leather and metal is un questionable. The harness is comfortable for the dog and is easy for her to move around in. She took to the harness within a week and after we got the new belly strap, there haven’t been any troubles at all. The fit is excellent. I love this harness and recommend it to everyone that I run into that needs this type of equipment. I direct everyone that I can to Bold Lead Designs that I can for that has any type of need that Katrina supports. I LOVE working with her. I have had my mobility harness for a little over two months now. It is beautifully made and worth every penny. My dog is not professionally trained. We are working with a wonderful trainer and making progress. Even though my precious dog and I aren’t a perfect team yet, I am out of the house and enjoying this incredible adventure. 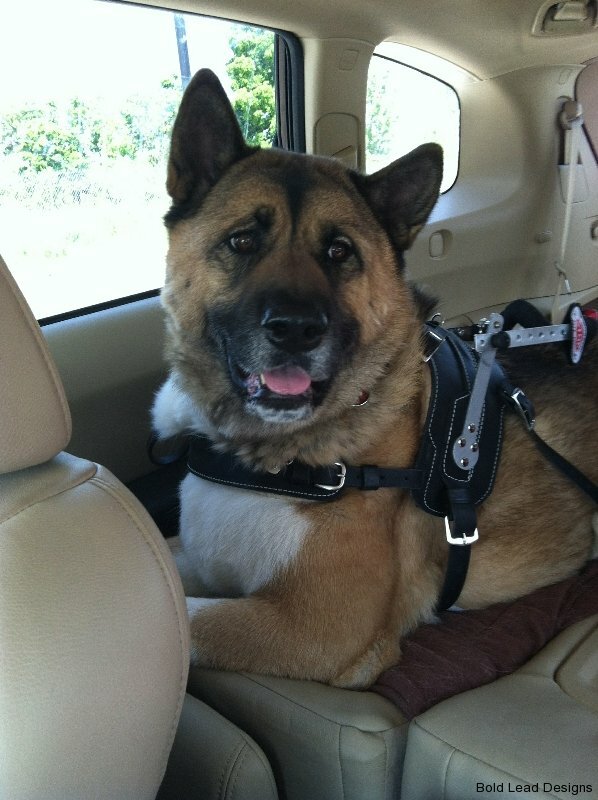 Many thanks to Katrina for her help – the fit of the harness is perfect. Let me simply add that I needed to remove the padding on the breast strap because it seemed to hurt my dog’s front legs when he walked. Otherwise, the harness is wonderful. AMAZING HARNESS! The quality and craftsmanship of this harness is outstanding and it is clear that a lot of thought was put into the design. My dog also loves the harness and seems to find it very comfortable, he actually runs into it now when it is time to work! You cannot find a better harness out there and this one will last you forever. Katrina really is an artist and I wont put another product on my dog. I know with her products that it will not only be of excellent quality, but also be safe and comfortable for my dog. I just got my MSH harness & cape and I absolutely love it!! The quality of workmanship is amazing and I have already gotten many compliments on how good it looks. I’ve also now purchased 4 8-way leashes with the oldest being about 3 yrs ago and it looks as good as the day I received it. I will never buy leashes from anyone but Katrina and Bold Lead Design. 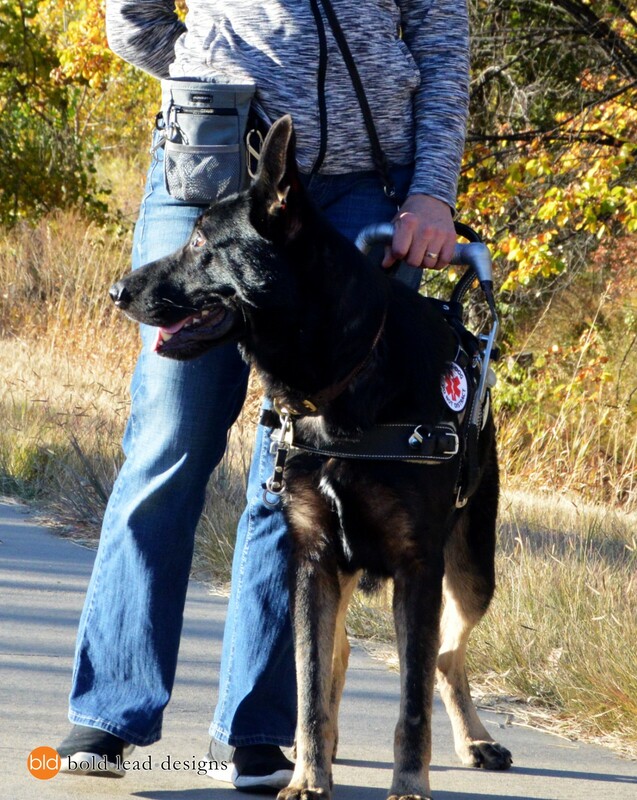 Journey and I have been using our mobility harness for a month now and I am really impressed with the fit, craftsmanship and overall professional look. Not only that, it’s safe and comfortable for him, provides the support I need and makes us really able to work together as a team. Sigh! Sometimes life hands us lemons… That’s when we need to grab our powered juicer and share lemonade with friends. Embrace life with the best possible tools we can find. As my neurological problems advance, I need more assistance. 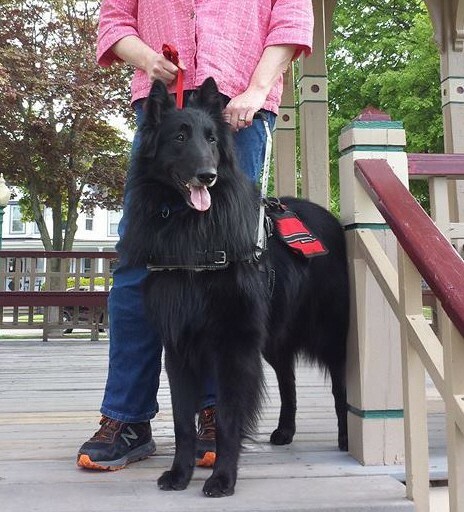 So, I started the long training process to teach my dog to be my Mobility Assistance Service Dog. And I started to look for the best tools available. 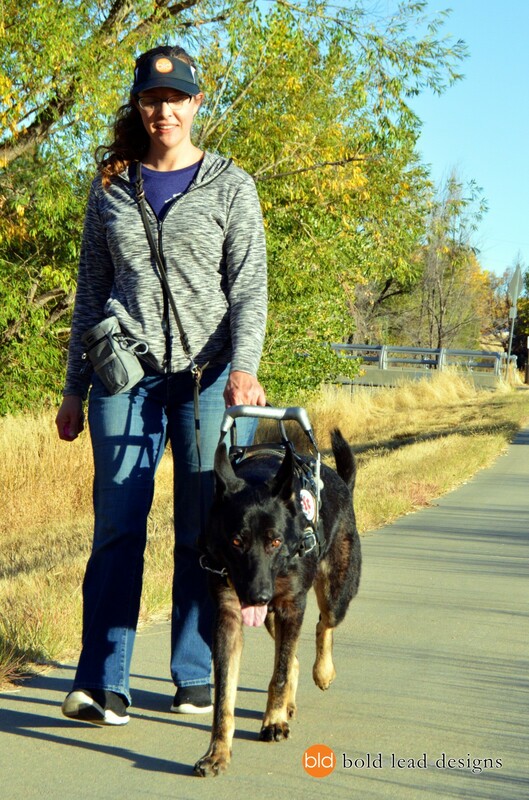 I spent hours searching and found several users who were happy with Katrina’s Mobility Support Harness. Yes, it’s expensive. But this harness needs to last around 10 years. And my dexterity continues to decrease. It is important the harness be easy to use. I needed a design that made it simple to use even with my awkward hands. So, I ordered a Mobility Support Harness. Though I was hopeful, the quality of workmanship on the harness astounded me. The leather quality is exceptional. Though it is new, it’s not terribly stiff. However, it feels quite sturdy. The stitching is very even, tight and consistent. The handle support is rivited to the harness with FOUR rivits. Most manufacturers would think just two would do the job. The ability to easily swivel the handle down is a great design – and easy to use with the pull rings. The fit on my dog is exceptional. As recommended, I adjusted the straps to get the best fit. With those adjustments, it is very sturdy. It does not slip about. What’s more important is how the harness seems to transform us. The handle tends to transfer my intentions to my dog, who automatically reacts. I start to turn left and he senses it. I start to turn right and he senses that. And he tends to counteract my normal tendency to weave about it bit. It’s a normal reaction. Dog’s instinctively react against pressure. Lean into them and they lean back. Lean away and they lean away. As a result, my instability is stabilized. 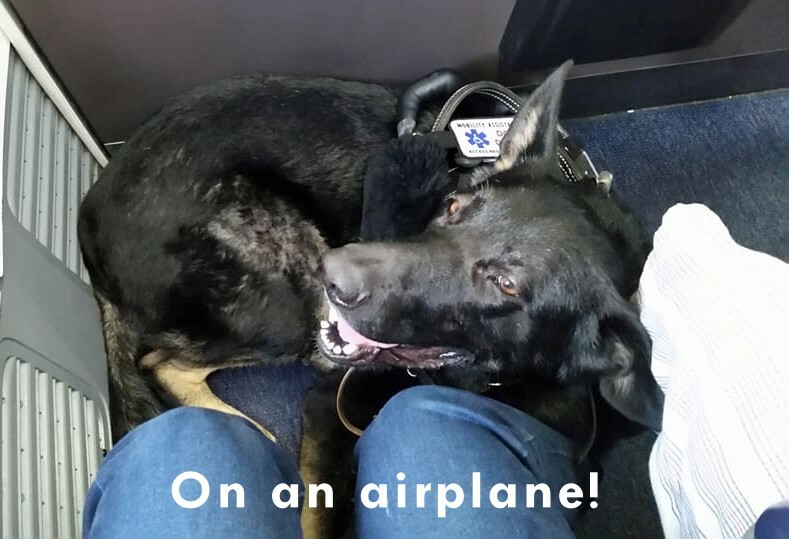 As another person with ataxia noted, having a service dog makes it feel as if you have a mobile handrail that goes with you. I’ve had my mobility harness for a year now and it’s by far the best thing I have ever used! I had a harness before this but it moved all over and it wasn’t even high enough to really be of any use. BLD Mobility harness is by far the best thing I have found on the market yet. Saxton loves to wear it and wears it with pride. It looks so professional and works so well. I don’t have to worry about it breaking and with the help with fitting it to Saxton perfectly its just so care free. Katrina has been so easy to work with and so helpful with the whole thing. Even when things go wrong she’s right there to help figure out a way to fix it. She has saved my life with this harness! And her leads are amazing as well, most leather leads are hard and bulky and her’s are just so easy to use! 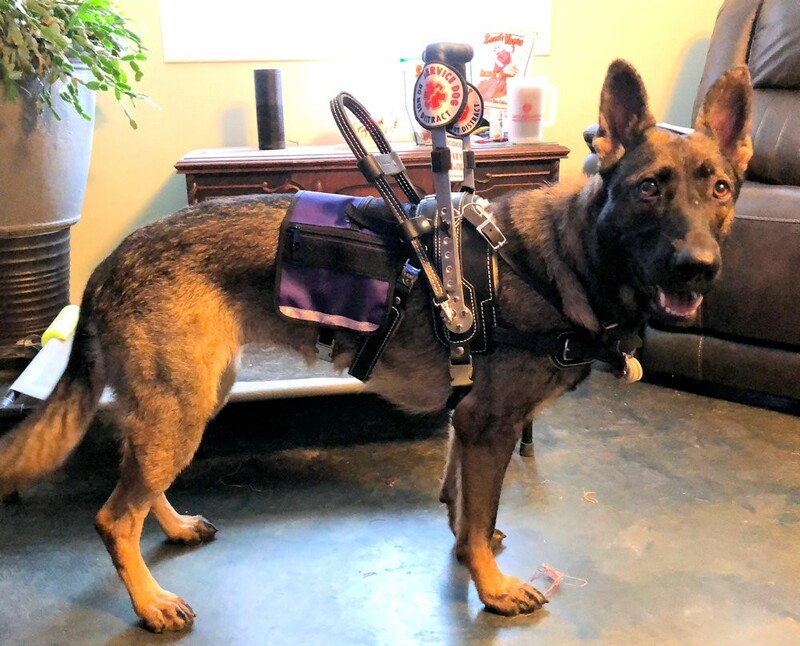 Blaze and I started out with the basic mobility harness and then when I needed to upgrade to the new harness, Blaze was able to adjust to the Mobility Support Harness. This harness is by far the most comfortable and easiest one to use. I can feel the support I need and I can see that Blaze isn’t under any strain at all when he’s working. He actually enjoys being in this new harness. Thanks Katrina for providing the upgrade in your usual timely manner! Even my Doc thinks I have found a “great source”. I love what you do. Thanks! Great harness, far superior to our previous harness. Excellent fit, Moses is much more comfortable now and literally sticks his head into the harness as soon as I pick it up! Fold down handle is a great feature, especially for restaurants-no more bumping into the bottom of the table. My only suggestion is to make the knobs on the outside a little more flush with the handle so they don’t get hung up on my trousers. Otherwise a wonderful product. If you have found BLD your search is over. Hands down Katrina makes the best mobility harness on the market. Best quality& durability around ! I wanna thank you Katrina for opening up a whole new much less difficult world for me & Hershey both. Yes it says five stars but deserves much more.